Before you read the rest.... When you are here, you probably are interested in tube testers in some kind of a way. Same as me! I remember I threw away a shoe box full of used ECC81, many Mullard and Philips, using a defective tester (in 1988) and they tested all in the '?' range. I didn't have much knowledge about tube testers. I thought an old tube tester is like an old multi meter. Not very accurate, but when it works it is probably ok. Later I learned the old tester was indicating too low vaue for all tubes, and perhaps these tubes were all fine. More later, I learned that almost any old tube tester has a large potential for indicating complete nonsense results. It is amazing how completely wrong they can read. You may not notice, and use it 20 years like that, and feel great about it. That is because you have no reference. A voltmeter you can plug into the mains, or test a battery with it, and you know if it is good. With a tube tester what will you do? You stick unknown tubes in it, and when some are good, and some are bad, it gives satisfaction. Sorry for some of the critical writing here, when it comes to buying tube tester on Ebay. Also for me, there is sometimes no alternative for having to buy there. So I prefer to write about things as they are, and in some cases it is beneficial for all of us, to have good understanding of the (real) habits at Ebay. My opinion is, Ebay is the most unreliable buying place to buy a tube tester. This page has grown much larger as expected. Please note this: This website is a commercial one, meaning I live from it. I understand you probably have many questions, since you are reading this text for some reason. Still I need to take care of orders first, so I can not answer emails asking for free technical support. Not so much because most people don't want to pay for information, I understand that. It is just I don't HAVE the time to take care of this for you. So for any questions about a broken tester you bought on Ebay, or somewhere else, just post it on the Jacmusic tube tester forum. When I have time, I may even answer it myself perhaps, and like that the information doesn't get lost and is helpful to all of us. What tube tester do you need? I get this question many times by email! People have understood from this article, Ebay is not a good place to buy a tube tester, but they want buy a tester anyway. So the idea is often to buy a new made tester, and I am asked for advice. The question is then often like this: I have decided for an E-tracer or an Amplitrex, is it a good tester? The answer to this question can be, these are not recommended for you, because you need to know what is your 'must' and what is your 'want'. Roughly testers go into three categories: Parametric testers, Curve tracers, and Quality Testers, as simple as that. It is important top set your 'must' and 'want' accordingly. Not always the most "accurate" test data is better. It is so "interesting" to have a curve tracer, but when you buy tubes for quality, meaning a range from 'weak' to 'strong', and you want read that from the tube curves, you can do more than I can do. When tube curves look optically bad, it is far too late. Much before that, soem better ways to measure would have told you so. Tube curves are for constructing the working point, during amplifier design. A parametric tester is something for people who know a lot about tubes, because parameter by itself are useless. Yes they are, because they only make sense in relation to each other. So people end up with the standard working point, using this as ultimate test for random tubes, having to guessing where the limits are. Take 10% or whatever they "feel" is nice. So they have a precise paramtric tester, and then need to guess if the results are good or bad. This brings us to the next categorie: Quality testers. That is what most 0users need to know, but buy a parametric tester or a curve tracer instead. A good quality tester will neither give you tube parameters, or a curve chart. It just tells you: Bad-?-Good. Mostly on a red-green scale, or a scale with numbers. Since you have little options to check the result, you should not trust a low cost Quality tester. The good ones have a good repuatation, they are never cheap, and they are heavy, and with a lot of test possibilities. the end they have their main use for tube matching. I think it is not so interesting to match bad quality tubes to each other nicely. Some testers can do two things at the same time, liek combine a parametric test with a quality test. Like AVO mk2 and higher are famous for that, but also L3-3 can do that, and a few others. Most of the time though, testers are parametric testers only, or Quality testers only. New made testers. I am a bit reluctant here. People are often impressed by the variety of electrical tests, these new made testers can do, like tube curves, get printed test data, and the illusion of precision, when digital results are presented with many digits. If this is what you want to have, so to say for fun or hobby, or technical reasons, like when you have an audio lab, or a tube lab, these are the products you need. Parametric testers are ideal for tube matching, BUT that will only work when you know exactly how this is done yourself. The testers itself often only touches the subject. Do not think this is going to give meaningful results quickly, from learning by doing. That will rather take you a long time, and you will make mistakes in the beginning, such as being an over-critical matching professor, or not understand what burn in does to the tubes and to the matching. I realize people igonore this text probably, but it's the truth. So the choice cones down to what is your 'must'. The mostly asked question is: How good is a used tube, and what's the lifetime left in it? It is so weird, but all new made tubes testers avoid this answer, but give you all kind of data which may lead to this answer, but there is no guidance for that. Moreover, and I need to say this very clearly, parametric results are not ideal to find out remaining tube life. This is rather the domain of the Quality Testers, they are not made without reason. Vintage testers seldom present parametric information to the operator. Yet in the end they come up with the answer to your question. They present on a good/bad scale the condition of the tube. After some experience with that tester, you will understand what '85%' means to you for this particular tester and this particular tube. A few rare Quality Testers will can also present parametric information, along with the quality percentage. So keep apart for yourself clearly what is your the 'must' and what is the 'want': Curves, parameters, or a Quality test. Good quality testers are: Most of the Hickoks, AVO Mk2, Mk3, Mk4. Funke W18, W19. (very incomplete list! ). The useless ones, are no real help to you. So the 150...300 Euro these go for, is a waste of money. Value: When this is an issue to you, a vintage tester always keeps is value because the tuen market grows, anf new made testers typically avoid quality testing. Why to use a vintage tube tester? This repeats some of the above issue, in more detail. Vintage testers offer functions new made digital testers do not have. Digital testers suggest precision. However that is very probably not the case, and not what the average user needs. Most people in reality only need to know: Is the tube still good, and how long will it still last? Modern testers like the AT1000 give no answer to that at all. Even so the AT1000 is a very confusing tester, and makes many mistakes. So fine, you know the plate current is for instance 81.5%, but 81.5 of what? Wel.... of 100% of course. But was that the question you had? Will you reject this tube, because 81.5 is not 100? You and the digital tube tester make a bad team, if neither of you don't know when a tube is bad or not, and at least the AT1000 does not know it. Put the same tube on a Funke W19, and it says. '20'. Good starts at '12'. Look! Now that is clear. Put the same tube on a Hickok and it will come very far into green. Wow.... and you were so disappointed about '81.5% of 100%' as the AT1000 told you. Such experiences I made many. Or even the AT1000 will say the tube is at 100%, so you are happy. You put in an amplifier and after 10 hours the speakers say: 'CRAX&%&%$'. Well, you better should have passed it through the Hickok or AVO leakage test, that would have spotted that leaky electrode, which the AT1000 can not test for. Or, you dig up some radio tubes from the 1940's and the new made tester -OF COURSE- doesn't have the sockets for it. Or the settings are missing, which you can -OF COURSE- make yourself, but is that what you wanted? So all in the end, you must see of a vintage tester as a concentrated amount of experience, build by those old tube guys, and you're buying this experience and comfort, along with the old tester. Sorry for saying this, but the lack of experience with the AT1000 software is painful. So if Hickok found out exactly this or that setting to reject a 6SN7, you can never replace that by a plate current measurement, not even testing the tube for shorts. I have learned to trust a test result from a vintage tester which is a good condition, more than what digital testers tell me. I have a fully restored Hickok 750. Though the size a large, I love it. When this tester says: 'Bad tube', well than that's what it is. At the moment I see many people returning to those good old analog tube testers, and I can understand it. Another compare is with the uTrace or Etracer curve tracer. Same situation here. In contrary to the AT1000, the software of uTrace and E-tracer is constructed with a lot of pride, and regularly updated. These little testers can do so much. However, also here, you have to judge for yourself if you like the test results or not. The question is, are you really capable of that. There is no help for the user, saying if the tube is good or not. So I see often people inventing self made rules, for when a tube must be replaced. Such rules are mostly wrong. Of course they have no other option, but that doesn't make the situation any better. That is because the digital testers don't help hem saying if the tubes must be replaced or not. To my opinion, such people are better off using a really fine, vintage tube tester. So I prefer to test a tube with a professional tester, from the period when these tubes were in daily use. These were made just to say how good the tubes still are, and for me that is often the main question. If the tube is still 'fine' by such a tube tester, then transconductance etc suits normal applications. For very old tubes like the 45, or old rectifiers, I prefer an old (but good) tester like for instance the Hickok I-177. It gives me both 'Gm', and 'Quality'. Whereas the later model TV7, gives only 'Quality'. Very high gain tubes like ECC83 should not be tested on an I-177. Though official settings were created later, the input signal to this tube is too high. Such high gain tubes didn't exist at the I-177 was designed. Or, the AVO Mk1...Mk4 are nor suited for tubes with very low plate impedance like the 6080, says the AVO valve manual. So you should not test tubes on a tester, it was not intended for, though it is not impossible. 1) Perhaps this is the best place to advertise our calibration tube set. Guide to tube tester repair and calibration. 45 pages in color. Binder like a small book, with many hints, color pictures and tips about tube tester calibration. This is not available anywhere in the internet. We see someone selling a similar item on Ebay, on DVD for a crazy prices. This material is partially copied from our website. You get it for free with the calibration tubes. Also for sale as a book only. Test Tube4: Russian SQ NOS 6L6 with 10% heater voltage tolerance, Original blue box. Quick overview of all test data of those tubes on a plastified card. Free email support about how to use those tubes. 6SL7, 6SN7 and 6L6 RCA are tested on a range of perfect tube testers, and documented results. 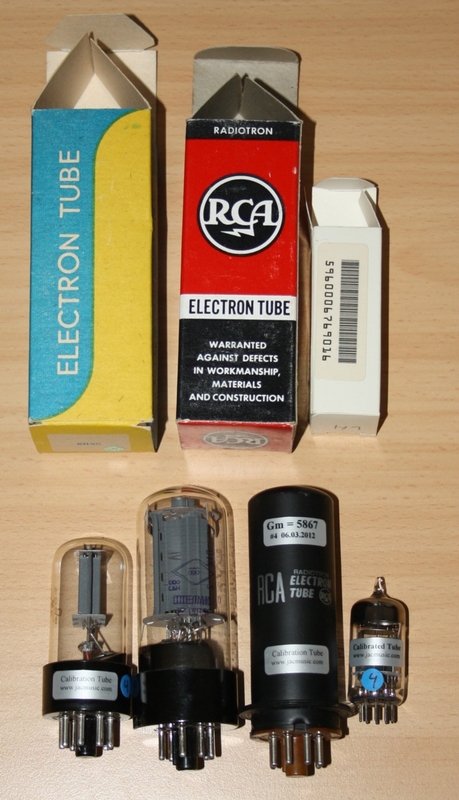 6L6 Russian is complimentary, this tube is to replicate the 6L6 RCA. (Instructions included). So the Russian 6L6 has no test data with it, and the RCA 6L6 is fully tested on all testers. Guide to tube tester repair and calibration. 45 Pages color printed, in binder. Read some part of it here. The use of calibration tubes. You can say at every AC Tester, you simply need such a tube for calibration. There is no other way as to take a known tube, and set the tester's reading for that value. Even so, from Hickok you could even buy them, but that is long ago. Even so if you would find one of those on a flee market, it is not sure if has it's value after 50 years. At Hickok they used the RCA Steel tube 6L6 for this. At AVO they recommend smaller tubes, such as ECC82 or 6SN7. Also for any DC tester they are a safe ways to verify the tester with a range of tubes, and check at several operating points. Also important it to check the leakage function of your tube tester, you need the leakage test tool. First the tester must be able to detect leakage in a reliable and predictable way. Then, if this function is verified, it also proves the deck with the sockets is not eaky, since any problem here would false any test result. Most tube collectors have a tube tester, that was not serviced for 50 years. Those testers that have serviceable parts inside, are likely to be off calibration in a terrible way, it shouldn't come as a surprise. If the tester was stored in a basement or a garage for the last 30 years, the components usually suffer from this very much. Capacitors have gone leaky and carbon resistors have internal cracks, and higher resistance resulting from this. This condition is where most tube tester are in, specially the Ebay ones. However most things inside the tester can be repaired professionally as long as the basic material is good. With this I mean the meter, the transformer, and wiring. With an unknown condition tester comes first VERIFICATION, which means you check a tubes with known values, and the tester should reproduce this within it's specified tolerance. Then, normally you find larger deviation than that, and you can do a calibration attempt. This means you calibrate the tester with a known tube. After this, some other types of known tubes should also indicate correctly, which is not necessarily the case. If you calibrate the tester for a 6L6, next you need to try if it works well with a know 6SN7, and then 6922. So this is what the calibration tubes are for. Suppose you find out then, your tester has some deviation even after calibration, you can still decide if you want to keep it, or repair it. A supreme quality METAL CAN 6L6, NOS RCA. It was exactly this type of tube, that was for sale by Hickok, long ago. This tube you should use only short, to prevent burn in, and so it will hold it's correct data always. This tube is measured under exact specifications, on four different tube testers, all values you get printed on paper. The average is calculated, and printed on the tube. This is the reference tube of the calibration set. A supreme Quality Russian 6L6, of a type made for instruments. (Page1- Page2). From this tube, you make a replica of your reference tube. It is explained in the calibration manual how to do this. This tube you can use for as long as you want, and simply re-calibrate it yourself from time to time, using the RCA METAL CAN reference tube. Then put the RCA tube to rest again. A USA 6922 with military specification. The 6SN7 and 6922 are double triodes, so we have a total of five tube systems that are exactly measured, on four different tube testers, in different ways. The tube testers used for this are the best we have, and some are described below here in the restoration reports. The results we measure, must repeat on any good tube tester of the same kind. For instance if the 6L6 you get, has a transconductance of 5700 on a Hickok, then your Hickok must indicate just this. Deviation max 5%. Also in the case your tester reads 5400 'only' you know now, it tends to indicate lower than normal, and you can work around nicely with that. A simulator for various kind of leakage belongs to this tube set. This is has known resistors inside. Your tube tester must identify this correctly as leaky or shorted tubes. The values are chosen such that the neon lamp of your tester will shown three conditions: 'just on', 'just off' and 'burn very bright'. You have to check for all three conditions. (more information about this product here) Remember heater to cathode leakage is the #1 cause of tube hum for tubes that test 'good' for the rest of it. So you sure want the tester to be reliable on this point. Quick overview of all test data of those tubes, on a plastified card. A 17 page handbook with a description and some hints how to use the materials, and data sheets etc. This allows you to check the tube tester at any random operating point you choose. instruction but i give up due to language circumstances. MERRY CHRISTMAS und Auf Wiedersehen! These tubes all test "GOOD"
What lifetime is left in the tube? How close are they to the original factory data? What about good Vacuum, good isolation? Rectifiers. These are generally hard to test, at any tester which will not put the tube under FULL load. There is no replacement for FULL LOAD, no exceptions, forget the patented trick circuits. So full load is for instance 250mA for a 5U4G tube. It has to give this DC output current without loosing too much voltage, nothing more and nothing less. Small signal tubes. Here the question is: Is the bias current correct? Only then it will bias correct in the amplifier, and only then it can give the right amplification at little distortion. Another way is to test the transconductance, which is a pretty safe way to say something about the use condition. There is one dangerous assumption, that is this: The tube was biasing good when new, and transconductance was good when new. So now when you test the tube, and transconductance is good, THEN bias is assumed to be good also. (this is an assumption only, and will not be true in all cases). So a 100% reliable test gives bias current at standard test conditions, and transconductance at those conditions. Note, many tube testers use home brew test conditions, like Hickok. This is works in most case, but is not ideal. Power signal Pentodes. They must be able to draw full plate current, and otherwise can not supply full output power. So you have to TEST those AT full plate current, and nothing else. Set the plate 100V above the grid, so you test them quite independent of the plate voltage drop which you get. Power signal Triodes. These are the hardest to test. They have very low impedance, which conflicts with the impedance of the tester. Hickok recognizes this by leaving out the 300B from most roll charts. Ok, this is honest. The problem comes, when you want to know the quality of a used tube. There was never a general method published for this by any tube manufacturer. This was always left up to manufacturers of tube testers. So... it means: Many tube testers, many methods. 1) Plug in a brand new tube in your amplifier, and see if the function improves. This result can't be denied! This method was used by many service technicians! The tube manufacturers had special cases for that for service man, with a collection of new tubes, one of each. If you have no other way, take this way! It is a very good one. 2) Measuring the DC plate current is a good thing because it is realistic, and it's hard for the tube. This is no job for a low cost, or also not for a 'patented' tester. There is nothing to patent on a normal, straight forward DC parametric tester, and this is the ONLY 100% safe way for power tubes. So once the tester has patents in it ... I get this 'no no' feeling. is supposed to give 10mA at 250Volt plate, and the specific grid voltages for this tube. It is 'good' when not higher than 14mA and not lower than 7mA. at the tech-corner of this web site). The end-of-life is below 6mA, or when the original value it had when it was new, has lost 40%. Now that is a very clear specification :) So of course THIS is what you like to verify, and the very moment the tester has a patent, it means it is NOT testing this way. I know if no testers that are an exceptions to this. So, also not AVO because they are patented too. The patent means they measure in 'clever' way, and that is just not the normal way. The GE Data sheet of the KT66 simply says below what current the tube is bad. Unfortunately these are the good exceptions, and most tube manufacturers avoided that question like monkey plague.When measuring real DC plate current, you need very precise and heavy electronics, these tube testers are expensive, and may need calibration or periodically verification of the tester. In the instruments world the definition about calibration and verification is a reversed one. Please take good note of this. It means when specified NOTHING, the instruments needs yearly calibration. If it says it needs a calibration every five years, then this counts instead. So no information = Yearly calibration. This the way the world of instruments is defined. So if your tube tester is from 1965, nothing is written about calibration in the manual, and it was never checked ever since, FORGET the results. It missed the calibration every year ever since 1966. Verification is a process which must be specifically ALLOWED by the instruction manual. So when not mentioned, it is no good way to test this tester. Verification means you compare the result to a know tube, and when ok, the tester is ok. VERY FEW tube testers are so good they can be checked that way. For instance Funke W19 can be checked that way. When is a tube good or bad? Generally it can be said a tube is bad when the original plate current is below 70% of the initial value for European tubes, and below 60% for USA tubes. So this is not 60% from the Data sheet 100% value, but 60% from the initial value the tube had when it was new. The initial value may have been lower than the 100% value or higher. Hard to say what the initial value was after many years. The best is always to mark it on the tube. Otherwise you have a dirty method here. To give an example: a tube has for instance a 100% Value of 100mA, by the Data sheet Suppose the initial value of YOUR tube was 70mA, when it was new. A European tube may drop down to 70% of that, so 49mA and is still good. But.... suppose the initial value was 140mA, then 70% of that is 98mA. Below that the tube is worn out! So you see how important the initial value is. Always mark it on a new tube when you know the value. Has the initial value got lost, you have to guess it. 3) Measure Transconductance. This is also good, because you can construct good tube testers, with little electronics, and get useful results from that. These often need no or little calibration, or just verification. So verification requires a calibrated tube, or another tester of the same kind to compare the results. However.... Testers that measure transconductance with little electronics are not never accurate with ALL tubes, and that's per definition. So the Hickoks are typically calibrated with a 6L6, and you can fully trust the readings with any kind of similar tube, like KT66 or KT88. However they are not capable of testing tubes like 2A3 or 300B under real life conditions. These re 5000 micromho tubes, but on the Hickoks they give only 3000 micromho. If they do on a Hickok, they're fine. In real life such tubes are bad. So you see my problem I have with any patented tester whatsoever. What is not so good, with 'Transconductance only' testers, is the unknown DC conditions for the tube under test. I have many Hickoks, and I find that a 'bad" tube on by those testers is definitely bad. These tester makes no mistakes with that. But how it came to that conclusion is unknown. If you do not want to know why a tube is bad, but you are only interested if it needs a replacement, a Hickok is THE tester. The ideal way to measure transconductance is with an AC (audio) Test signal, and adjustable DC and original Data sheet settings to go with it. Very very few testers work like this. Almost every tester has i it's own way to avoid this. Reason is, as said before, expensive electronics. Some very good testers however, are the higher class Hickok testers. These perform a real transconductance measurement, with a (known) Grid bias voltage, put a known AC signal on the grid, and from that measure the real AC plate current. Do keep in mind ALL Hickoks work with AC wave shapes, that represent equivalent DC voltages, and this limits the precision, no matter what you try or do. A better method for this, is not using the mains voltage a signal, but a higher frequency from an oscillator. Why is that? You may say you can also measure transconductance at 50 or 60Hz also? The answer is: No you can not measure that precisely at the mains frequency. Reason is, if the tube is humming (so it has a defect) the hum signal will be a part of the plate signal. So such the tube will read better than it is. The Russian L3-3 uses a 1400 Hz sine wave at the input of the tube, and a 1400 Hz selective Voltmeter. This is in fact a very band pass filter. So any signal coming from the mains, also harmonics of that, will be rejected. Also distortion and white noise of the tube is not added to the result, since only 1400 Hz is measured, within a few Hz only. The second harmonics is 2800 Hz, and filtered out. This method is the one and only true measurement of transconductance. I found almost no tester that can accurately measure the transconductance of larger directly heated power tubes like 2A3 or 300B. The testers I have, so far the only one that produces an EXACT and fully correct reading is the Russian L3-3. All other analog testers produce values that are quite imprecise. Also the great and highly valued AVO Mk4 doesn't come near. Wisely they left out the 300B of the AVO manual. Also most Hickok roll chart avoid mentioning the 300B. I found out the reason for that, is the too low plate resistance of those tubes. There is a hint about that in the AVO manual, but this hint is written in such a way that you will not understand the real meaning of it. What they mean at AVO is: Forget the results for all tubes with low Rp. The Hickoks also can't measure such tubes accurately if you ask me. Those Hickok testers that can't do it, also don't have the 300B in the manual. If you do test it, by simply put it in 2A3 and set the filament to 5V, you get wrong results. So it will read 3000 micro mho for a tube that has 5500. Also for your 2A3. But... who knows the real Gm of a 2A3 before testing it ...? So nobody finds out, and nobody will complain. The digital tube testers AT1000 ( we have three) is good, but the L3-3 is better. Just not as convenient, and the AT1000 software is a bit crude. The Sofia software is extremely delicate, like you can point with the mouse at any position of the a curve, and you get the three main parameters in one window, for that particular point. (G,. Rp and gain). Well for me, the L3-3 beats any tube tester I have worked with. any tube is connected as a diode, and it is tested how much current the diode can make flow through a load resistor. but say nothing about expected lifetime. So it told you what tube to replace to get your TV working. These do pick out bad tubes. So if that's all you want to know, this kind of tester what you need. Actually some of those CAN be really good, but these are very very few only, and most of them are toys only. Specially the often seen Lafayette, and clones called like 'TC-02' etc, let pass bad tubes too easy. Click here to read about the accuracy of a Funke W19 tube tester. “The point in question now is whether the emission or transconductance test is the best. This is determined in part by the circuit in which the tube is to be used, in case of an RF or IF amplifier tubes, the stage gain is proportional to the transconductance; this the Gm test is the most important. From: Fine Points of Tube Testing. by William F. Burke, Consulting Editor, which appeared in the 1958 Test Equipment Manual. There four ways to deal with errors 1 ) Prevent errors, by thinking ahead. 2) Learn from other peoples errors. 3) Learn from you own errors. 4) Not learn from errors, regardless who makes them. Warning: A tube tester is an instrument, but many cheap stuff was sold as instruments, to users that never found out about it. So in a way everybody was happy. On Ebay I see people outbid each other for testers with new appearance, sometimes NOS and in their original box. Prices of 300 Euro I see are becoming normal. This is so amazing, because such testers only tell you if a tube is broken or not. 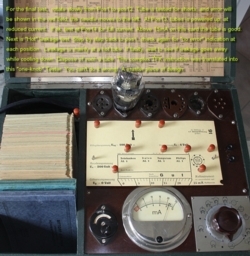 This is funny: When somebody offers such a tester as you see here on the left, all the seller needs to do, is picture it with a shiny new EL34 Telefunken, the needle nicely in the green, and everybody thinks: Wow! That is what I need! Only they forget there is no use in the reading, or even the reading wrong. So a good tube can come out bad, or vice versa. Value: 150 Euro, because always some fool buys them on Ebay for 300 Euro. Value for your private museum: 25 Euro. Here is a link the page about tube tester accuracy. You should also try the link there to MIT professor Lewis's youtube video about accuracy of measurements. Part of his lectures were even broadcast on TV. This young man is Professor Dr. Barkhausen. He introduced in 1918 a way to put the tube parameters into a convenient formula similar to ohm's law. Originally this behavior of tubes was discovered in 1914 by a man named 'van der Bijl', who worked for Western Electric. Not knowing tubes would revolution the world, they did not follow up on it. Actually I didn't have a good place for this item, so I have put it here. There is great misunderstanding about panel meter protection. I guess because we all think this is so easy to do. I mean just two diodes, and a capacitor, and you're done. But... are you really? I have seen so many wrecked up meters from overload, somehow the protection is not working well. We have to see there are some kinds overload. The first is too much steady current. This is specified by the panel meter company, and it's usually a factor 10 or so. The other is how much mechanical energy can the poor coil can absorb when the needle it is hammered violently in the corner. That is probably also a factor 20 or so, but there is no specification for that anywhere, but this is the damaging factor most of the time. The damage can be a bend needle and coil deformation. A bend needle is a problem for multi scale meters, as you can not zero this away for both scales. So when it is at zero for the outside scale, the meter is not at zero for the inside scale. The larger Hickoks have five or more scales, and the AVO's have two. Another problem with a bend needle, is the balancing weights of the needle are now at the wrong position. That is a big problem when the meter is not horizontal, and can causes an errors of 10% at some positions of the scale. The damage is also deformation of the coil, when the needles hat hit the corner violently. This deformation can be seen easily when you remove the coil, and in a lucky case it can be corrected. If not, you end up with meter unlinearity. So how to protect the coil...? In the AVO-8 multi meter I saw a system with a mechanical sensor, sensing the needle comes out of it's range, and via a pre-loaded spring and a clever mechanism, it switches a contact that interrupts the meter coil. So you have to press 'reset' again, also you pre-load the spring by this. Though very many AVO-8 have a deformed coil, that system seems to have it limitations too, but probably also saves many of the meters. Use of protection diodes. Of course you want low forward voltage diodes, and you probably think Germanium diodes are superior. Well most of the time they are not. Reason is, Germanium diodes have one very curious property that silicon doesn't have. Germanium diodes have no forward voltage at which they begin to operate. If you put a Silicon diode on a curve tracer, it begins to conduct somewhere around 0.6 Volts, we all know that. Below that, let's say at 300mV, the diode is just 'not there'. It is a capacitor, and that's all. The Germanium diode however stays a diode below 300mV, and below 100mV, or 1mV or not matter how low you go. Always the Germanium diode is better in forward direction as in reverse direction. It's a pretty bad diode at 1mV, so with lots of series resistance, but.... it's still there. This is why a crystal receiver can rectify signals of just a few mV. Not with high Effiency, but it can. You can never do that with a silicon diode. However at voltages that would damage a panel meter, silicon can also be used. Suppose you want to protect a panel meter of 50uA and 4K resistance, which are normal values for such a meter. That would be 200mV full scale. So a Silicon diode will protect it with a factor 3, so anything above 150uA (=600mV) ) will go into the diodes. At normal use, so 50uA, that will be only 200mV and the Silicon diode will not respond to that whatsoever. 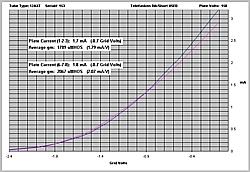 Whereas a Germanium diode will respond to 200mV with some current. (Both forward, and reverse current). Also a Germanium diode will respond to 100mV and to 10mV. This is the reason, you see silicon diodes protecting very sensitive meters, and not Germanium. Now, why do they use power diodes for that, like these really big 4 Amps diodes in AVO tube testers, or like the 1N5401 in the Unigor multi meters. Why not these little tiny ones like 1N4148, that are made for low current? Well... suppose you connect one 1N4148 to a voltage of 600mV and it pulls 1mA. Just suppose. What happens if you put 10 in parallel? They will draw 10mA. And 1000 in parallel will draw 1Ampere from 600mV. Now larger size diodes are nothing but a larger chip. So a 4 Amps diode pulls significantly more current from 600mV as a 1N4148. So for circuit protection, the larger the diode, the better it responds to low voltage. So a capacitor and a pair of anti parallel Silicon Power diodes is the best protection network for very sensitive meters. Have you already been cheated with a tube tester on Ebay? Welcome to the club! Ebay is not a good place to buy a tube tester. When prices are rocketing, there is too much interest to buy whatever is for sale. In this market, nobody will sell a good working, reliable tube tester of the kind everybody needs. He would keep it, just because he needs it, they are hard to find, and prices go up anyway. That is why they are so hard to find in good condition. What is for sales is the whole category of testers that are of little practical use, or seem impossible to calibrate, or have repairs coming up, have fungus inside, or other reasons, to dump them on Ebay. So don't believe you're going to be the lucky guy, paying only a low price for a fine tester. Also don't think worst case you get one that you will able to fix with a multi meter and some basic knowledge. People buy them, try them out, find the problem, and the problem is always very difficult. I have lost of negative experience on Ebay. You will hardly ever find a tester that you can repair elegantly. I thought so myself too, but that was a long time ago. Typical problems are always hard. Like partially shorted transformers, bad panel meters, none repairable switches for Funke and Neuberger. All kind of things that were impossible fix by the previous owner makes the thing land on Ebay. The seller always tries to appear the untechnical Mr. nice guy, so he wants to put you in the 'lucky' position. Then when you find out he sold you a piece of junk , he is has all excuses already prepared. The Ebay text was formulated with great care, and in the you end up as the 'unlucky' guy. Reality is often, the seller has been trying like mad to get it fixed, and gave up on it. Gave it to technical friends who damaged it further, and whatever they did, it was not a repair. With the crazy prices on Ebay, he just sells it, and buys another one for the same money. WIth a few tries he can be lucky. So he can't go wrong. And nooo... I am not paranoia. I talk about my experience here. You have to read those Ebay adds with a sharp eye for detail. Just look at the above picture. What animals do you see there? A cat and a mouse? No sir. It's a cat and a hamster. When the tester is sold as 'defective' they bring half of a 'very good' one. When they are advertised as 'from my uncle who passed away', that is regarded ideal, because there is common belief that dead uncles leave always good working tube testers to untechnical nephews. We must be realistic, we can not ask the dead uncle any more. What you are buying, in reality is: Untested, no guarantee and no returns. Most of the time, you find feedback of the seller, related to tubes, and the seller is buying and selling old electronics. And when his uncle leaves him a tube tester, he sells it untested. Look at yourself, would YOU sell a tube tester untested? Wouldn't it be better to check if it works, and get a higher price? I see this so often, and in the end the people come to me, asking if I can fix it for a low price. Forget also the testers that were found in a garage. These can't be fixed with contact spray. 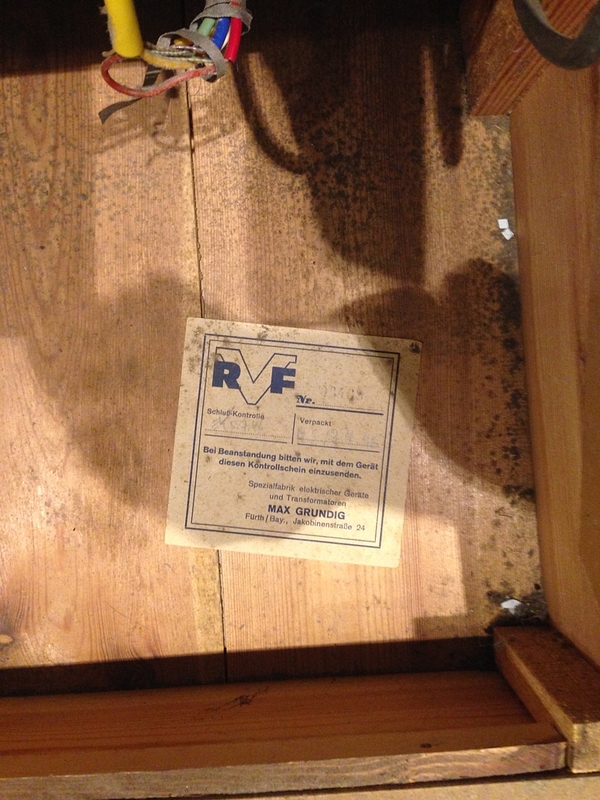 Or, the seller says it was 'found on the attic' and you think that is good, because attics are dry. Well, perhaps you will find out WHY somebody put this tester asleep decades ago. For instance the transformer has some defect. Then today, first you have to repair the rusty witches and bad contacts, and when you are done, you find the transformer is still a bad as it was before. So you will come to the same conclusion as somebody 50 ears ago. Such things happened to me several times! Don't take a tester with a cut off mains cord. This means, long ago the mains cord was worth more than the tester. Well ok, prices of old testers have gone up, and prices of mains cords have not, but the signs are not good for such a tester. Also don't take a tester with the deck plate screws missing, or it has shiny new screws. It only means, long ago someone thought it wasn't worth putting it back together. This one is a very reliable hint: If case looks treated like junk, for sure it means: Somebody treated it like junk. The question is only, what makes you think he was wrong? Or, a tested looks extremely used. That is a very good sign, because somebody used if for decades, and never had the need to replace it. Take only a tester that is guaranteed to be OK,and ideally it was used by the seller itself. It won't be cheap, and still the seller knows better than you why he sells it, but you get at least a basically working tester. Sorry for the lecturing, but i know this from the many requests from people who bought their broken testers on Ebay. Ebay Examples of useless testers. A waste of money, no matter where you buy them. SO WHERE DO I GET MY TUBE TESTERS FROM? I get them from people I know, and for the rest of it, I am not buying from strangers unless cheap. When buying on Ebay, I only take sellers with 100% positive, and I make the proposal I can try it out, and when the thing is not as described, I can send it back. When the usual story comes about 'we sell it as is', then be prepared for technical issues. So just walk away, or pay 50%only. What would you say when you can buy a vintage car on Ebay, from somebodies uncle, who just died. Of course it is "believed" to be good. Just the nephew had no option to test it, it was just in the garage for years. You get pictures only, no guarantee, no return, and payment in advance. This alarm bell, you should have with a tube tester also. LINK to Ebay PROBLEMS. Here we go again. Some very popular vintage testers. 7) Tube testers collection - ANALOG PART. CONCLUSION: Better as you expect! Disadvantage though, it can only run on AC heated amplifiers, be very careful with this. The bitmatic is very unknown, but let's try to change this here :) When you are thinking of buying an Amplitrex AT1000, and willing to spend this much money, consider also the Bitmatic. Though of course the Bitmatic is something completely different. This tester is based on the Hickok cardmatic, which a fully programmable tester, but it is programmed with cards. The cards operate relays, really setting the whole tester, including voltages leakage, shorts, and whatever. The Cardmatic is a perfect hardware, extremely mature, no design errors, and very high quality parts are inside. The idea was here to operate it via PC, and not with punch cards. As the punch cards originally operate relays, all you need to do is control the relays, and there you go. 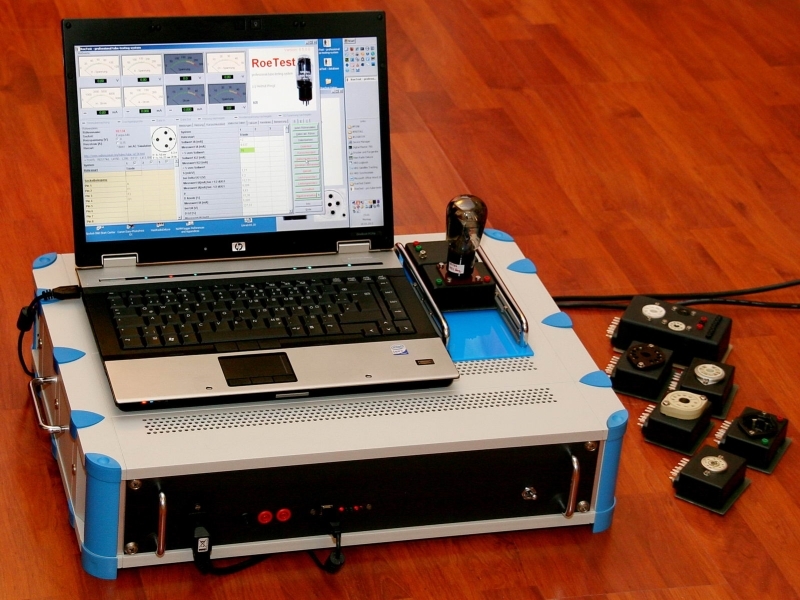 The cardmatic by itself can really do extremely detailed, versatile, and complicated testing. It's regulated power supplies are all tube based. Disadvantage: the tubes. Advantage: the tubes! So you will be able to service and repair it after 30 years just normally. I doubt that about the Amplitrex. I am not trying to sell the bitmatic here, but it's a great machine. The cardmatic is completely refurbished, apart from the Relays What I see as a small disadvantage is the software is under DOS. Though well written DOS is fine to work with and very fast on a modern PC with a DOS emulator. You do need to understand how to install the DOSBOX emulator. Well or you can run a real DOS PC, but that is not recommended, as you have 10x better options with DOSBOX. Such as quit DOSBOX, and print the files under windows. I have never tested the Bitmatic, but my impression is very good. It seems to be able to test a lot more than the AT1000, and the heater is AC, which is more logical for testing Directly heated tubes. Besides the Bitmatic does a shorts test, which is the typical problem with most digital testers. As this costs many relays. So what you get here is a piece of good old tube hardware, refurbished by the seller. New made digital controllers (seem pretty rugged PCB's. no SMD Stuff) and DOS software. So DOS you need to like, and be able to set up the Emulator, but then DOS software by itself seems better made than the Amplitrex if you ask me. You do need to know the limits (maximum voltage and current) are lower than the AT1000 probably. For that, you can extract more data and more curves from the tubes. The bitmatic is also a heavy piece whereas AT1000 is light weighted and compact. So none is better than the other. I would say AT1000 is better for Ebay sellers, or when you need several (we use three) but Bitmatic is better when you want to study in detail your own tubes, and when you have time, and want to know all details. People praise the software updates of the Bitmatic, which is a good sign. My recommendation is, only buy it with schematics, so you can service it still after 10 or 15 years, and definitely the selling price WITH schematics will be another when you would sell it. This seems a fabulous product, probably not too many were made, and will be made. The Alladdin Mk1/ Mk2 is a new made digital Tester from Slowakia. More information will follow. Almost unknown brand tube checker. 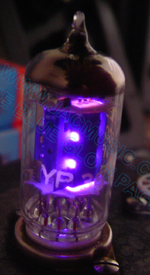 These use all tubes as a rectifier, and load that rectifier circuit with a variable resistor. It's the 'D' knob here. Work at too low voltage, and do more things wrong as well. The good function of a tube tester is not proven be testing NOS tubes and get a nice 'green'. The question is, if a particular '?' tube comes out just that way. 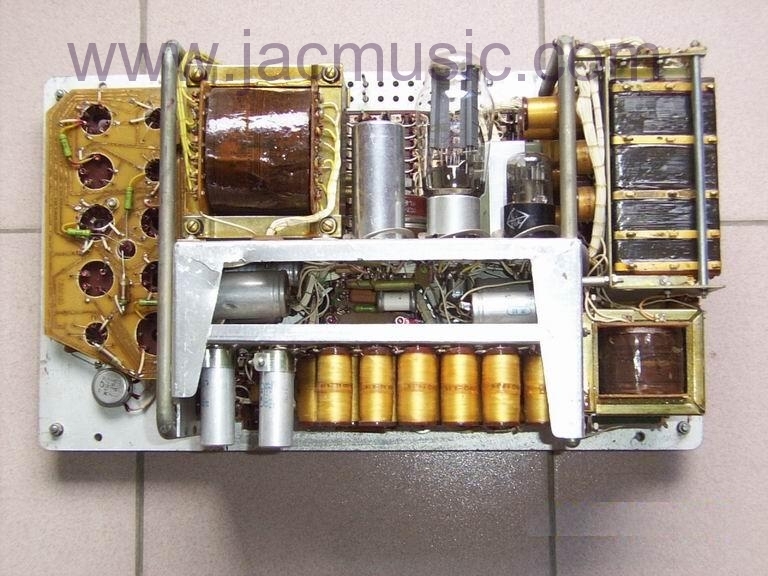 For instance the Japanese TC-02 (Very often sold on Ebay) gives a 'green' to almost any tube, good or bad. The TC-02 is a piece of junk so to say. However I had two TV10 from Superior instruments, looking the same way and these picked out the bad ones quite good. So yes, such a tester can work, but only if you have proof. I would say it is worth 50$ for the fun of owning it, but you can not test tubes with it in a reliable way. No stop! It's worth a lot more, because you can sell in on Ebay nicely. Yes, that's what you should do with it. 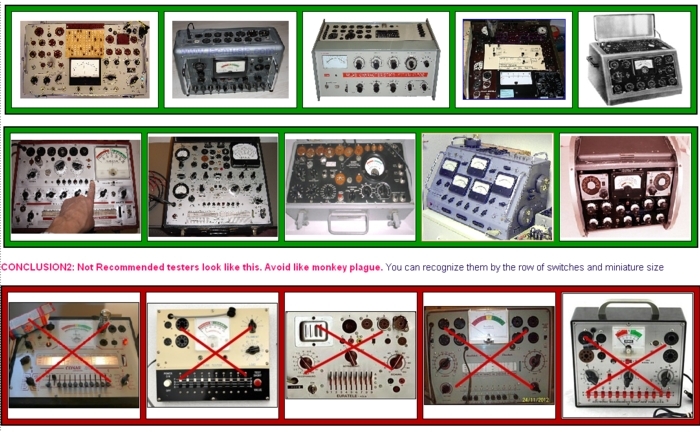 Many DIY testers exist, and it is interesting to see sometimes 50 years old versions of those. Some are really nice done, and some not so nice. Today, often the testers are made as digital products, and you can see the maker getting deeply into software issues, and the hardware getting larger as intended. For that reason, a nice way is use digital panel meters, and for the rest set up the tester in the good old analog way. From my own experience I can say, use only industrial meters for this. The Chinese Ebay meters have unlinearity problems. Suppose you calibrate it for 1000V full scale , and measure 99V. So you switch to the 100V range to get more accuracy, but you measure suddenly 98V. (Mmmm ?!) The reason is panel meter internal unlinearity. You can't calibrate that away. The expensive meters don't have this problem. Since the tester is an instrument, you need to make the full concept before you start, keep the wiring simple, yet prevent to forget functions that you have to add later. So the thing gets serviceable later. With the concept being 'final' from the beginning, you can make a nice front plate, use nice knobs, and paint it professional. Here is one of those products, which I think is extremely well done. It was made by a private person. He is 78 years old, (while I write this in 2011). He admires tubes for the industrial design 'art' in them. So this is somebody with time and experience, and the right heart beat to build something ultimate. The result is the most beautiful analog tester I ever saw. Read more about it. Bought it on Ebay, and got cheated with it. According to the German seller it was very accurate, but it produced complete nonsense when I tried it. I decided to keep it, and repair it later. Well this tester is a strange one. It seems to me like an AVO Mark 5. The principle is completely the same as the later AVO's have, only compared to the ELPO 508, the AVO's are almost primitive construction. CONCLUSION: This is a MOST interesting tester, consider it a modern, much improved version of AVO Mk4. The Eico 666 is a very nice tester. It's not one of those 'diode' testers. So the ones that test all tubes as diodes. Though it looks like one, it's not!. The inside is exceptionally nice made, and components inside are high precision. This is an instrument! Beware you buy a factory wired version, and not a kit version. Kits can look terrible inside, and may have wiring errors. The test circuit of the 666 is very good and mature. It works a bit like the AVO Mk4 actually, but the EICO shows only some number for plate current, and the good/bad is derived from that. (so no transconductance measurement). Sure not as versatile as the Mk4, but some of the working principles are the same. Also the leakage test is done the same. I bought this tester for a special project. More about it here. FUNKE. (Max Funke) Electron test equipment factory. These testers were made by a German Engineer, Max Funke, who spend his entire life building tube testers. After the war he found his company located in the Russian occupied zone, East Germany, and his property was stolen by the government. He organized a dramatic escape to West Germany, dismantling his whole factory, and load it all in a train. The cargo was supposed to go the West, with false papers, and Max and his family would escape to the West via another way. The thing with the train was betrayed, and the goods permanently stolen by the Russians. However the Funke family could escape in 1952, and he founded the company Max Funke KG together with a partner who financed him. As he had all plans in his head, he was able to ramp up production in West Germany in only 6 months. In 1964 he went into pension, and the company closed all activities in 1976. After this time comes a very curious period, that know very little about. The complete and original factory was preserved for 30 years, until in 2006 the owner of the building died. What I know I was only told. The children, who inherited the building where not interested, and only wanted to sell the building. The sales of the building + what was inside, was done by a broker, from whom the contents on the shelves was uninteresting, as he gets his percentage of the building sales. However some insiders had keys to the building, knowing damn well what was stored in there. It was the complete inventory of a 45 years old company. I was send pictures of this, by someone who was in good and honest contact with the Funke family, and he was so upset by what happened. Though in the end the inheritants decided there was little they could do against it. Inside was a massive amount of half finished materials, incl 50 (!) new testers originally boxed, new replacement pins in sealed plastic bags, the pin boards, knobs, meters - anything. A complete wall with shelves, and a pile of each PAGE of the blue book. I saw pictures of that shelve wall myself. Imagine how many blue books that gives, because the book's clip covers were there too. Full boxes of resistors, sockets, TONS of new test cards, and may many other things. Like Ali Baba's treasury cave. All of it laying nicely sorted on shelves. It happened around 2006. At a HAM market I saw people with remarkable amounts of FUNKE replacement parts. There is a movie on youtube about the old factory, but I can tell you this was after a great lot of stuff, was already removed from the building. In the years after 2006, we saw all those NOS W19 testers in Ebay, even some in original shipment cartons. What shall I say. Even today while I write this in 2015, people are selling dozens of complete NOS sets of test cards, blue books, and knobs and meters and whatever small parts in lots. You can just see there is a 'source' somewhere. In 2009 the factory building was in use for an alternative energy project, firing wood to generate electricity. The factory documentation as it was found, is now stored in the archives of the German Museum in München. 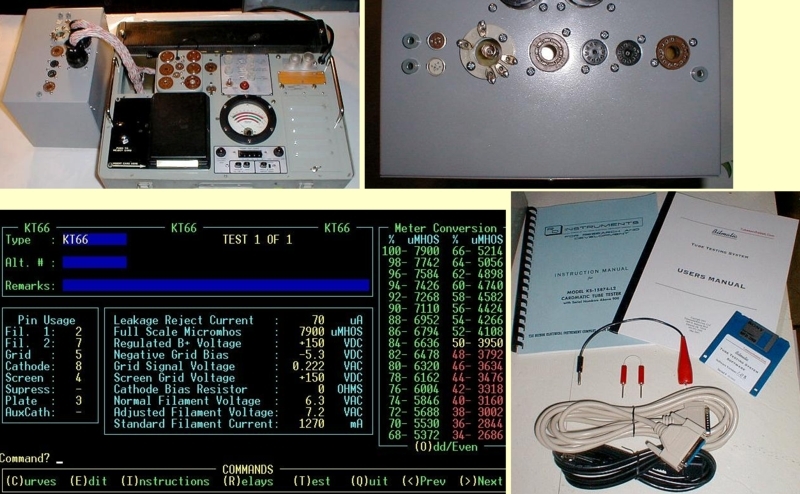 In the internet I found some documentation on a Funke Oscilloscope, and also some grounding test equipment he build, as well as TV picture tube testers. A miniature capacitor tester, a battery tester, etc. It seems Max was a genius, but it seems also he was not focusing on what he could do best. The later tube testers had cards for transistors too, but things went too fast for him, as he became older, and there was nobody to follow him up. His work with tube testes ended with two top models, the W19S and W20. Though he had a new parametric tester preparation, model W23, but this one never made it into production, since the end of the tubes production was near. 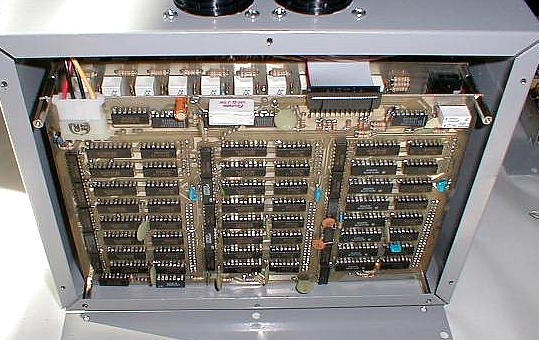 The W19 (S) is the largest and final model which is completely programmed via the punch cards. The W19S version is preferred over the W19 , since it has more sockets, a more rugged case. Though W19 looks nicer, and is lighter weight. A total of 5000pcs W19 were made, and I think most of them still exist because it's an after war model. 1) Parametric tube testers, like W20. 2) Emission testers, like W16, W18, W19. 1) Parametric Testers. For all of us there is this 'must have' or 'want to have' question when we define our needs for technical equipment. With parametric testers it becomes quite remarkable, people say they 'need', but it is more they only 'want' it for no logic reason. 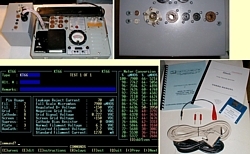 They feel simply attracted by the many knobs and meters of a parametric tester, but they do not realize, these knobs and buttons and meters, they ALL have to operated when you test a tube. Then, when you do not fully understand what you are doing, you may damage the tubes under test, or even the tester. This is really difficult to hammer into peoples mind, but it is just for this reason, Emission testers were made. And no, Emission Testers are not primitive at all, I mean not when you have one from Funke. (more about this later...) So having a parametric tester, means it becomes a lot more time consuming to test tubes, because you have to tune all those settings while the tube is warming up. So when you change the plate current (by yourself, or just because the tube is warming up) you need to re-adjust the plate voltage, as it tends to drop. Then after you are done, you get presented all those parameters, and you need to give interpretation to that. Hopefully you know how this is done. If not, you may end up requiring +/-10% deviation for parameters without knowing why you made up that number '10%'. And no, datasheets don't help out with that. Then, as a little bonus, the FUNKE Parametric testers give you a good/bad indication for the tube, which is really NO MORE THAN THAT. This is very important to understand. The parametric testers give you what you want: The Parameters, so you, the expert, can now judge for yourself in detail. To put it in simple words: A parametric tester will give you the tube PARAMETERS, and not the TUBE CONDITION. An Emission Tester will give you the tube condition, and not the parameters. Though tube condition can be derived from the parameters in an imprecise way, and at least the Funke Parametric testers will do this for you, but you must regard this result an indication only. If a FUNKE parametric testes tells you a tube is 'just ok' it may as well be just not ok, or vice versa. So, if the holy grail question is how much lifetime is left inside, then you what you need is a Funke Emission Tester, which is specially made for this purpose only. 2) Funke Emission testers. Make good note, the Funke Emission testers have nothing, really nothing to do with all those cheap, crappy little testers that you can buy on Ebay for prices from 100..300 Euro. Such are worth almost nothing, and they are only useful for what they were intended for, and that is find the broken tubes in a malfunctioning radio. A really high quality emission tester, is something else. This tests the tube's Emission under hardest possible conditions. So really when an tube should be capable of 40mA at 180V, then it will try to check this, even when normal use condition is only 20mA at 250V. So as you can see from the example, the tube is even thermally overloaded at 40mA /180V, so the handbook for such an Tester will say not to test the tube longer than 30 seconds. This is a real emission tester. Again, not to ne confused with the Junk on Ebay. An Emission tester is testing all amplifier tubes (...hold your breath...) like a diode. I also wondered myself what the idea behind this is. At first I thought that was a cheap way to test tubes. How much I was mistaken by that! Later, I found the answer in the blue book by Max Funke. The idea is indeed having no interest in Grid voltage settings of the tube. The method Max Funke uses, is very wise. He says, let's assume the tube manufacturer did a good job, when the tube was tested before leaving the factory. This means, the transconductance was above minimum and below maximum. Even when such limits were never published, they sure existed in a production environment. Same for the plate impedance, and the tube gain. This was all within their own (un)published limits. Also the plate current at specified conditions was correct. Then the tube was found to be good. It was sold, and used in some equipment. Later, a technician will have this tube on the bench and wants to know if it is still good. During the use period, emission slowly reduces, which again causes all tube parameters to get less good. Now, Max Funke says, all we need, is a fully reliable way to find out if the emission is still good, and if so, all other parameters must be good also. Of course this assumption can only be true, if the tube has no leakage or vacuum loss, and if basic functioning is still given. Here is the proof: If you have some worn out tube, that you intended to throw away, you can re test it at 50% higher heater voltage, which boosts up emission to 'like new' for a short time, and you will see the worn out tube tests like new this way. Or, vice versa take a new tube, and reduce the heater voltage by 50%, and you will see all dynamic parameters, and plate current are the same as with an end-of-life tube. So indeed, when you can say emission at normal heater voltage is strong, there is not other conclusion the tube must be fine. Let me repeat the assumption, the tube was fully tested by the manufacturer, and the tube passes now a leakage and gas test with good result, and basic function is given. So the Funke emission testers works like this: A) Test the heater. B) Test all electrodes for leakage, one by one. C) Test emission. D) Test for Basic function. E) Test for gas.Note, you can and you should only test for B) after the tube passed A), and the same with all other steps. If it fails at one step, you need to stop and reject the tube. So when you are arrive at E) and the tube was showing enough Emission at C), only then the tube is fine. All of this is done with just one knob, and takes less than a minute. Personally, I believe there is no better method. The question is only: How to test emission? For this, the Hickok company tests the tubes at reduced heater voltage, and as all Hickok do: at much reduced dissipation. Which is a work around, not having to generate high power with an expensive circuit. The Funke company goes the ultimate way. They test the tubes at the normal heater voltage, at maximum dissipation, and then tests if the tube can do more than normal plate current. The test result is crystal clear. A tube must read as a minimum in the '?' range. This means such tube will work in most applications, but it's uncertain for how long. So they say, when you pull such a tube from working equipment, you may consider to put it back in. That is what the '?' mark is for. The next is where 'good' begins. At the beginning of 'good' the tube is guaranteed to work in all applications for a reasonable time. To work very long, it needs to be somewhere above. As a rule of thumb, a NOS tube reads 30% higher as where 'good' begins. It is as easy as that. This is for amplifier tubes. Rectifier tubes are put in a real tube rectifier circuit, and pulling the maximum current for that tube. Then, the output current is quantified on a scale in the same way. So '?' and 'good begins at'. Make note, all Funke Emission testers, even the tine ones, can test at max 500V AC and max 250VDC, and so at at max 250mA. 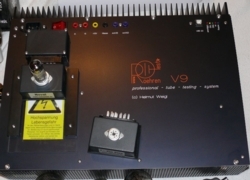 Even so, high power amplifier tubes can be tester at 500VAC and 250mA. So 125 Watt dissipation. That is really remarkable. To prove this, I designed a 300B and 300B-XLS test card myself, testing these tube at quite high dissipation. Why testing like this works so fast? Well heater test and leakage test take only a fraction of a second. You can rotate the main knob quite fast to 'Emission Testing'. Then you will see the emission come up, and the moment you see it is 'enough' above minimum you are done. Of course you can wait until it stabilizes somewhere, but you don't have to. Already at minimum, a tube is fine, and needs not to be replaced. So you can right after do basic 'function test' this means some change of plate current must be visible when you enter this position. Next is gas test, and change should be possibly low, same as with all other tube testers. Already you are done. For the specialists, you can go back now to Emission Testing, and let the tube get really hot. Then, when hot, rotate back step by step through all the leakage tests (quickly) and you are now performing leakage tests on a hot tube. Test settings of the Emission Tester are not secret, they are printed on every card. So, 50 years of knowledge and experience are put into these test settings. That is kind of hard to replace. Knowing this, look at such silly emission testers like TC2, and what stupid circuits is inside, and you really wonder why people pay 300 Euro for such a 'thing' on Ebay. 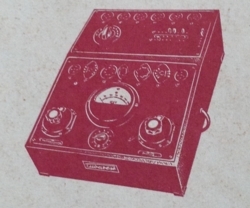 The is the first model of the one-knob testers which works without internal battery, and the negative grid voltage was made by the power supply itself. After this was made the W16, W18 and W19 which basically work the same, only have more sockets. 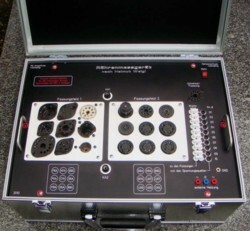 This tester has received the name 'Einheitstester' in English 'standard tester' because it had only the European Standard sockets. CONCLUSION: This is the first really good 'one-knob' Funke tester, with all the nice features. Funke W19. Factory price in 1968: 425 Euro. 20 years manufactured, from 1952....1972.
but that was just about it, for the rest it was a mess. At least the basic material was very good. The man paid me back some of the money, and for me it was ok then. I love good instruments, and I spend over one week restoring and calibrating it, including the meter linearity. Now it is like new again. So you plug in the pins on the test card, and you can read if the tube is good or not. and needs no calibration or service. it means the internal electronics is working. They thought of the user's comfort. THE tester amongst professional tube dealers. Here is how the W19 works, it is as simple as efficient and reliable. The W19 works with test cards, and you can make no mistake with those. We all know this strange feeling when plugging in a 500€ tube in a tester. You check all settings 5 times, and still are afraid for your expensive tube to blow up. When testing an ECC803S with any other tester than the W19, first I plug in a cheap JJ tube. However when testing an expensive NOS RE134, I have no cheap JJ tube to try it first. Here is where the W19S comes in, it's a good feeling you can do really nothing wrong. All voltages are set by the card. The internal voltages are taken from a ladder network. So the plate voltage is stabilized, but also other stabilized voltages derived from this. Now what is nice, you rotate the only button it has, all though the positions 1...13. In position '0' the whole tester is off. From 1...10 it performs all the leakage and short circuit tests, and each test is passed when the meter stays on the 'zero' position. Suppose it fails one test, the meter goes to the left, into a small white zone first, which is acceptable, and if it goes further a red zone begins, which is where 'leakage' starts. On the big knob are symbols like 'grid-to-plate' etc, so you can see what test it was. That is all there is to say about how it works. I tested it with a KT88 and an external 400k resistor from grid to filament, and it indicates the middle of the red scale. Perfect! Position 11 is the actual test, and the results is pre-printed on the test card. Position 12 gives the transconductance by changing the grid voltage from 0V to -2V. So you need to calculate the micromhos (=mA/V). The transconductance test is invalid with tubes that cut off at -2V, but also here the cut-off should take place, so at least that you know, and the tube is probably good. With other tubes you can calculate the transconductance like this. Position 13 gives the vacuum condition, and you're done. The cards are the software, the W19 the hardware. What is nice about the cards, they have the tube main data printed on them, including connections, and standard settings. Also many replacement types. Then it gives the actually test settings in the W19, the plate current, and most important, it tells you what is bad, '?' and good. These cards are really accurate. That's why I like the W19 so much. Prices: I collect some from Ebay, prices are rising quickly. Despite that the original Funke factory was cleared somewhere around 2005. From that closure a lot of material came on Ebay, specially stacks of NOS test cards, several blue books, switches and meters. Even new cases have popped up on Ebay. Still prices go up and up. I bought mine for a few hundred Euro. You can only dream of that now. There is the W19S and W19. The 'S' is the military one, and looks less nice, but it has more sockets and a higher rated transformer. It can do filament current up to 4 Amps and plate dissipation up to 50Watt, but also can delicately and precisely measure battery tubes at less than a mA. It can test bigger tubes also with an AC plate voltage, which makes it possible to test any tube up to 250mA. The reading is in equivalent DC milliamps, which seems to represent real DC measurements nicely. I tried that out. Rectifiers can be tested used up to 250mA. Making tests cards is a piece of cake, because when you remove the card, you have all the settings nicely printed underneath. So you can select the plate voltages AC or DC by plug in the correspondent pin. When the test does what you want, you can make your own card quickly from a sheet of paper, and stick the test pins through the paper. Read here about an interesting 1935 patent from Funke. This tester was never made. A very Good idea: Replace the stabilizer by a NOS tube. CONCLUSION: Top Model, no compromise tester. Ideal for for who want to get a very quick and reliable result, which is totally respected by everyone. I have one seen a W19 on Ebay, which was a very late model, and it had a semiconductor rectifier inside, and a ceramic multi-deck switch instead of the older type rotational switch. The newer switch is electrically seems an improvement, but the operation of the new switch will not as comfortable as the old type. The old switch is fine too, but it definitely wears out quickly. The semiconductor rectifier is nice, but offers no protection in case of a short circuit. I was asked to put in here, an honourable mention of the General Radio 561-D and 1661-A, and I sure will do that. 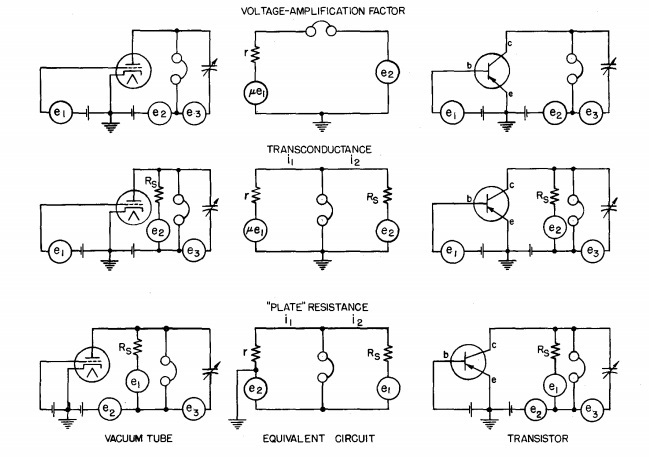 Test circuits for Gain, Transconductance and Plate resistance. These are no tube testers in the commom sense of the word. 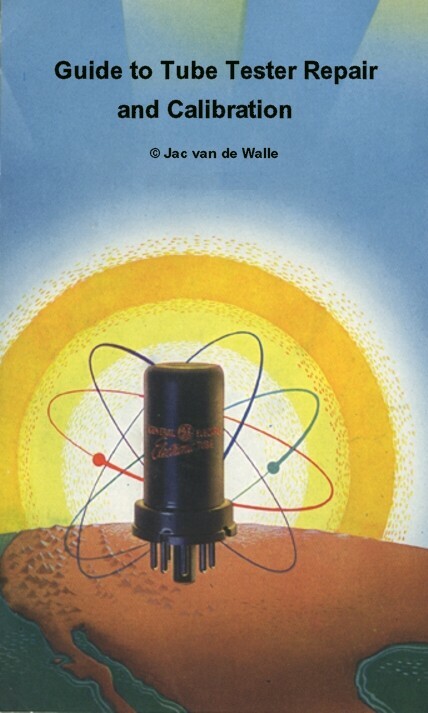 There were intended for manufacturers of tubes and transistors the measure any kind of dynamic parameter. They needed external DC voltage sources, to bias the DUT (Device Under Test) and also external unstruments to supply the test signal, and read the result. The virtue of those was to supply a qualified test setup, and eliminate any errors due to capacitance by using a bridge ciruit. They were used by all manufacturers to write their tube and transistor manuals. Tubatest 2: Version with the adapter kit build in, in one bigger case. The adapter kit has a switch for various octal based tubes. Also it has enough place to add Noval Sockets if you want. 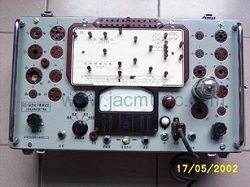 This is interesting tester was made right after WW2, under the company name RVF (Radio-Vertrieb Fürth). Tubatest can be found at low cost still, and it works nice. The Tubatest 2 that I have, is a nice piece of hardware, in a strong and nice case, and you can work on it easily. The switches are nice made and high quality. The way the operate is logical and well thought of. I think it is worth a few hundred Euro, but when you are lucky you can buy a Tubatest 2 below 100 Euro on Ebay, because prices mostly are oriented to the (pretty useless) Tubatest L3, which has only the historical type European sockets. So, Tubatest 2 is my secret tip, or otherwise Tubatest (1) when you can get it together with the rare adapter kit . Buying Advice! Most information and price orientation in the internet is for the pretty useless Tubatest L3. That version is for the museum only, because it had no adapter kit build in, and no connector for it either! If you ware looking for a nice tubatest, you need the "Tubatest 2". Don't be confused by the numbers. "L3" is the small one. "2" has the adapter for Octal sockets build in. Curiously, unlike the L3, the "2" version had no lid. So you migh get it cheaper because the seller thinks the lid was missing. Also as they had no lid, the deck plate may be in detoriated condition, and the meter as well. It really depends on the storage. The original manual was with it, in collectors condition. There was a name stamp on it from a radio shop, and my impression is, this was the first owner. I had no time too look at it, but I did so 15 years later. Searching for that shop name, I found the empty shop for sale at a broker, and also a family website, and somebody wrote they inherited that radio shop and they said they sold the old equiment on Ebay. So I was the one who bought the tester :) I learned that 15 years after I bought it. After opening the tester, it was a time capsule. It was never worked on. Inside was a loose paper, saying it was manufactured April 1946. So 72 years ago. You have to understand that date. In 1946, Germany was occupied by the Americans, and Max Grundig was forbidden until further notice, to manufaccture radios as he intended, because he had employed 150 deported women from Ukraine, working on parts for secret weapons. During his work for the Hitler regime, Max Grundig learned a lot about military equipment. So he said, ok if I am not allowed to produce radios, perhaps I can produce tube testers? And they let him do that. Some years after, he was allowed to start a radio factory, and he dropped the tube tester line. So Tubatest 2 was the last one he made. Though I am absolutely sure I was the first person to open it, I was surprized by the quality of the wires and isolation materials. I could leave that all as is. It looks like any normal plasic wire from today. The two switches are over engineered quality, and the metals of the switches is a solid silver alloy, and you can take them all apart until the last piece. The work which needed to be done, was cleaning of the switches, resolder (all!) joints, fully restore the panel meter, and some small repair of wood cracks. It is in perfect condition again. This tester works very reliable and is able to do many modern tubes, if you take the trouble to find out the settings. It even has original settings for 6L6. Which you can also use for KT88. I have drawn the schematic with new software, and then it became clear how it worked. The method for testing for shorts and leaks is clever and interesting. And most of all it works. We get the same situation as always. If I put am RE84 radio tube from the 1930's on the tester, it will for instance say, it is "weak but just ok" So I know that. Then I can put it on a curve tracer and get the curves, which tell me nothing. I can test transconductance which is 25% lower. All of that tells you nothing. But this tester, primarily made for such tubes, sais it's "just ok".... I trust it. Grundig's company rise and fall was impressive, and their end came when they went for the wrong video recorder standard. They never got over that, and Max Grundig died in tjat period. His very young wife had to clean up the mess, and sge managed the company from one das to the other. She took several wise decions, and perhaps Max should have let her do so before. She was able to save some parts, but it was little compare to what it once was. Officially the company still exists, now in the hands of marketing people, selling products with "Grundig" printed on it. Technically very beautiful. Seems like a small Neuberger RPG 370. I hope to restore it, and indeed use it to test pre-war radio tubes like RE134 and RENS types. Read more about it here. 1. Models before the Hickok patent. Very old testers, not practical today. Simplified versions of the large case testers. Lower precision, smaller size. Require more settings, but can also do more. Have higher generic precision, due to less compromises with the circuitry. Some have even a separate filament transformer. Micromho (=ma/V) readings, by means of a patented Hickok two-tube circuit which you will find in all testers with some variations. 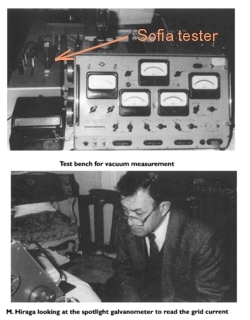 Some of the later solid state testers had the same circuit. Because of this 'standard' circuit, each tester is a good one. Future Tube life indication. The 'English' reading with most of the testers. Some Laboratory models have additional tests. Wooden case is extremely rugged. Deck plate is nicely engraved and solid. Gas Test. This is done with a standard test circuit, by putting a very high series resistor in the grid. The idea is, that tube gas gives grid current, and this will generate a small voltage over this resistor. The small voltage will add to the DC bias voltage, and change the bias of the tube. This change has always it's limits no matter what causes it. So regardless if it is gas if leakage, we always call it 'gas' when you have a Hickok. Noise test. This seem a nice method, though I must admit never tried it. You have to connect am AM radio receiver antenna to the noise test output, and if there is any noise, this will give loud crack sounds on the radio. Electrical safety. The deck plate is not grounded. This has advantages and disadvantages. Better would be if it was not made of metal. Test dual tubes with just the flip of one switch. Let me tell you what that is. Somebody invented the unit 'Mho' as a reverse value of 'Ohm'. That by itself makes me feel funny about it. In Europe they didn't want the word Mho, so called it Siemens. The ridiculous thing is now that we can call a resistor of 10 Ohms also 0.1Mho or 0.1 Siemens. The idea was to describe the conductivity (conductivity is the opposite of resistance) But actually all passive components have only resistance in my healthy opinion. Now tubes are active components. The output current is regulated by the input voltage. So these try to conduct. Their behavior is best written down as milliampere per Volt. So you change the grid voltage 1Volt, and the output current changes 5mA, and we say the tube has 5mA per Volt. (5 mA/V). Here we go.... that equals 5000 micromho. Because Ohm is Volt / Ampere, and Mho = 1/ Ohm. What a useless mess! Anyway this can not be changed any more, same as some countries will use miles and gallons, no matter how unlogical it. You must see the use of micromho in that light. Anyway, this explains why USA testers have micromho on it, and many USA data sheets too, whereas European testers always use mA/V. To make it a bit more confusing, generally but not always, the micromhos are called transconductance and abbreviated as 'Gm' and the mA/V are called 'S' for Siemens. This is another of those things. English test is used by the Hickok testers, and it is a not so good way trying to say you are testing the tube under (an unspecified) load condition. The AVO company in the UK probably made the best recognized series of testers, that tested the tube under load, however they specify exactly what load, and you could read that on the meter, and make all settings yourself.. So you could compare that with tube curves and data sheets. Apart from that, they invented this red-green scale, where the good/bad result is derived from the transconductance (data sheet !) values. So very clever, and very straight forward. In the USA that was called 'English' testing. This AVO method was patented, which was a major strike. So Hickok had to patent something else. They patented the 'English' test method, which is the RED-GREEN scale you see on most of their testers. I investigated the test results of know to be good and know to be bad tubes, and my conclusion is, it just derives a good/bad value from the already know Gm value. Same principle as AVO, but they (have to) do it in another way, in a very strange way, and in the end the RESULT is the same as with AVO. Test results: With a socket adapter, I just measured the plate current of the tube, while turning the 'ENGLISH' dial, and guess what.... Nothing changes! Only the needle moves when you turn the English dial. So I can only conclude, this changes the sensitivity of the red-green meter, and nothing else. Still the English test is the most used, since it tells you 'good or bad', and the setting of the English pot meter from the roll chart, is the knowledge of the old tube exerts, put into the tester. Admitted is, the results are very reliable, that's why I keep my Hickoks, no matter what. Some testers like TV7 have only the English test. Will upload pictures later. This is an older kind of tester, probably already having the Hickok patent inside. This is the same as the I-177, only the 531 is the civil model. It doesn't have the potted transformer, and anti fungus treating of the I-177. It is a very old one, so before you buy it make sure it's not rusty inside. It is a nice tester though when you have a good one, though the general rule applies here, if the case looks rotten, the inside is also. The mains voltage meter you see with this one, is retro fitted. The standard way to adjust the mains is via the main meter. Basically this is THE Hickok tester for the pre-noval tubes. The later model was the TV7 , which could do also test Noval tubes. The I-177 has an interesting way it operates, and this is worth a few lines here. They use their famous patented Hickok circuit, but in the I-177 they added a potentiometer which does noting else then change the meter sensitivity. The signal going to the meter has to pass an attenuator potentiometer. This is the 'L' potentiometer. The result of that is, you can test any tube at all, and have a correct reading on the good/bad scale when you know the setting of that attenuator potentiometer. (Of course they knew that at Hickok, and this is the 'L' value in the handbook). Since the good/bad readings are done by measuring true, dynamic Gm, there is also this particular position of that potentiometer where the Gm (micro mho) scale is valid. This position is marked with 'gm' on the L Pot scale. So the good/bad reading and micro mho reading is done with the same circuit. Their patented Gm measuring circuit is the best of it's kind as far as I know. Due to this patent all other manufacturers had to work without it. It tests all known rectifiers. Also the big triodes like 300B can be tested, and as we know there are not many tube testers that can handle this tube. Not even all later model Hickoks can do a 300B. By experimenting with the settings I can now measure many unlisted tubes with it, like C3g and EM34. It's really a very nice tester, very much recommended. The circuit diagram is inside the tester on a plastic plate. (Fungus proof....), and an Excel list with all test data I found in the internet. These will all work in 100 years from now. They used to be cheap, and regardless useless. Some start to understand how good they are, and prices of those went up a lot over the last years. The bargain days are over, a good tube tester is expensive no matter what. I think these are still a good buy for the money. Here is how to find out settings for an large size tube, like KT88 or so. Set the Bias (R) pot for highest reading. Now rotate R clockwise, until you read 90% of maximum, and this is the bias setting. May be take a little less when the fuse lamps indicates a lot of current, and you think this is too much. The calibration comes in the next step. Adjust the L pot until the tube is in the position of the good / bad scale where it belongs. So that is just in the green for a fairly used, 'just ok' tube. Now L + R + Sensitivity is a set of information that you must use in that combination. This is a relatively high bias, which is hardest for the tube. I verified some Hickok settings, this is how they seem to do it. Here is the KT88 setting I found that way. A=8 B=5 Fil=6.3 L=70 R=42, Socket E, Gm switch at 6000. I have not yet tried this for small tubes, like ECC83, but there was no need also. The manual was complete so far. The A-Version uses only a 2.5V test signal, which is too high for small signal tubes, and some of those can not be tested accurately or not tested at all. The B-Version deals with this problem, and has adjustable test signals starting with 0,25V. Tubes that need lower input signal, are tested with lower signal. The ranges are switched automatically when you change through the Gm scales. So 533B is much preferred over 533A, if you also want to test the later kind of tubes. This one came after the I-177, reminds me a bit of the 600. It has very few sockets. No direct reading of Gm in micromho. It has very straight forward way of operating it. What is nice, is the test switch and the short-circuit switch are combined, so you go automatically through the short test, before doing functional testing. Very popular tester. Switches inside are ceramic. Very good service documentation exists still today, and it has nicely arranged calibration settings inside. So if you only want to do a good/bad test without knowing what or why, this is your tester. CONCLUSION: Disadvantage: High market price, low functionality. Advantage: Compact reliable, easy to access internal circuit . I regard it a serious shortcoming, it gives no tube parameter of any kind. Just 'percent'. This is a simplified version of the 5xx series. They left away some test options like lifetime test. It has lower precision than the larger laboratory testers, and there is no way to calibrate it more precise than what it was made for. Reason is, the Gm reading is done with a particular setting of the English scale. For instance for the 3000mmho scale, you must set the English pot to the red dot '3000'. Then read on the 3000mmho scale. So this saves the range switch, the 5xx series has. The 600 has a red dot painted on the English scale for each range. However, the 3000 dot is almost at the beginning of the scale, may be only 10...15 wire windings away from it. When you try to set it precise, you will notice each winding of the wire wound the pot meter will give a change of the meter indication. So no matter how small the dot is, at the beginning or at the end of the dot, you have two different readings. Needless to say, the position of that dot is hypercritical. It means you depend on the original factory precision, and you have no practical way to make the tester any better than that. However the small size and simply way to operate it, made it very popular. It sort if did what the not-so-critical technician needed, and frankly speaking it still does so today. I do not know what the extra feature of the 600A is compared to the 600. The tester you see here, is my own but I sold it in 2011. The advantage of these smaller ones is their weight and size. The only practical disadvantage I see, is some smaller accuracy, but you have to know for yourself what accuracy is a 'must' and what is a 'want'. Given the age and condition, a good 600A can measure within 10...15% which is more than you need for practical use. 3) Read tube test result. Here for 12AT7 EHX new tube. This is a strong one. The largest laboratory testers. For me, these all have one BIG disadvantage: the English scale is missing. So the tester doesn't tell you if the tube is good or bad. You're supposed to be able to tell this yourself. The so called advantage of the bias setting with it's own voltmeter is only a marketing gimmick, because the scale is too tiny, and unprecise.The the 539 series are easier to calibrate than the 750 series, but a well calibrated 750 is also something very nice. 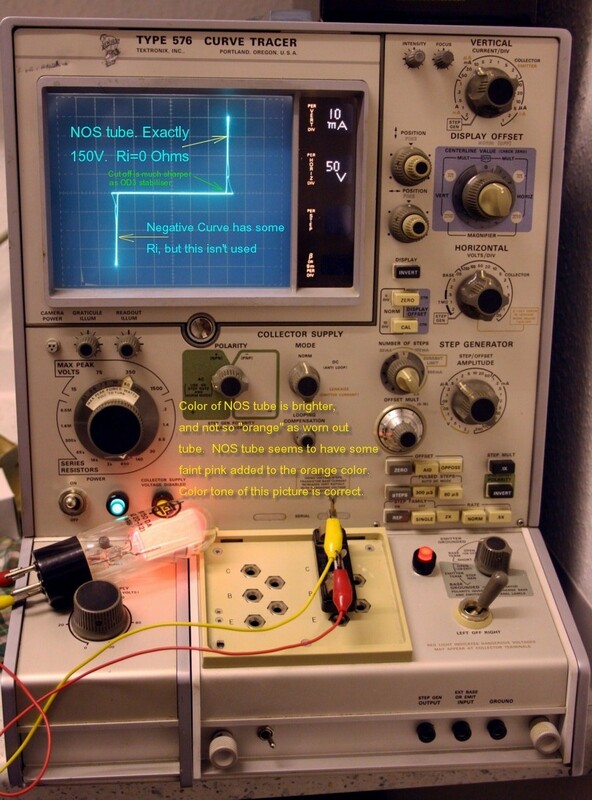 Next thing: 'This tube tester is fully operational' Mr. E. Dekker from Belgium writes. Well, the Gm value reads twice the vale as it should be. So it is useless. He tells me this 'must have happened in the mail'. Interestingly, he points out already in the auction text to accept no loss of accuracy that happens in the mail. Now look at that... So he already 'expected' the tester to damage in the mail. (You see what I mean?). Now look at the Ebay picture. This tells it all, but I must admit I didn't notice while bidding. Here you see a tube tested, and the meter is all in the right corner. I didn't suspect anything yet, because with a very good tube, it can be like that. Only the problem is, it does so with ANY tube I try, even a broken one. Press the test button and the meter gives a minimum of 100% reading or more, no matter what tube, even without a tube. Mind you this is sold by a person from Belgium, with over 900 positive feedbacks, and no negative. Well, this tester was broken as can be. I offered to give it back, and he writes: 'No discussion possible'. Don't understand me wrong, this is no way to complain about a bad deal here in EBAY. I put this here on the web site so you can all see what appears to be normal at the moment. Please learn from this, even people with all positive feedback do this. So this is going to be my next restoration project. Then I will show here in detail if there were any other hidden defects in this tester, and what I had to do to repair it. For the readers of this web page, this was my learning experience, and it happened to me, though I really tried to prevent it. Conclusion: This tester gives completely useless readings, the case was wrecked up by a monkey, and the main meter sticks. Both 750 I bought, had good basic substance as I got it. No serious damage, and only worked by good technicians. Well almost. One had a sticky roll chart, which must have driven the owner crazy, ending up using a big screw driver, violently pushing the wheel, until it all broke down. But that was all of the mistreatment it got, and I could fix that at almost no cost. I had an NOS roll chart, and digged up a new thumb wheel. It seems to me, the later roll charts are simply too big, and these roll not smooth for that reason. For making it an accurate tool for daily use, there was a lot to do still. The other 750 I have appears virtually unused, but that doesn't keep the electronics from aging. The 750 is a refurbished 532, and Hickok tried to replace the 539C by it. My opinion is, the 750 is one of the best Hickoks there is, and more useful than the over hyped 539C. More about this later. What is really nice with the 750, is has additional to the classical two tube Gm test, an adjustable DC voltage of 200V, 100mA. I found both my 750's can not supply full current and full voltage simultaneously, so that must be how they are. When exchanging the 83 rectifier for an 83V, maximum currents exceeds even 100mA, while the micromho readings don't get affected. Perhaps I will change this later, but I think this is going to take some exchange of other components too. At least I need to check this better, and for the moment I will leave it as is. The voltage option lets you test stabilizer tubes, but you can do also other things with it, as you like. If you don't know how to do that, it's better only to test things as indicated on the roll chart. Later on, I will show you how to repeat Funke W19 tests with it. The 750 differs from the smaller testes like 533 and 534 because it works with different AC test signals, instead of a fixed signal. It has this in common with the 539C. This allows testing of tubes with very high gain, so no overdrive will occur. This makes a 30.000 micromho scale possible. They put back in the load test in the 750, which the 539C is missing. I think it was a mistake, to remove that with the 539C. The latter can only measure transconductance, no load test is done. Also you can't compare the transconductance you measure with the 539C with your tube book, because the plate voltage of the 539C is too low, and simply wrong for most tubes. Next is, the roll chart data of the 539C is lower than for a new tube. That was done to give you a way to pick out the bad tubes, because in the end that's what people want. So Hickok put a non-standard roll chart in the 539C, with lower values than normal. So they printed the reject value on the 539C roll chart, not the 'new tube' value. (of course you 539C users, you all know that... he he). This makes I don't like the 539 so much. To to stop the confusion, Hickok put back in the load test in the 750, and also give standard tube data on the 750 roll chart, same as with older (normal) testers. That was a good decision. I never found any documentation about how this load (English) test is really done. The word 'English' suggest the AVO method, like in the Mk1/ Mk2...4, and CT160. I will check that later, with an oscilloscope. The oldest tester I have, using the AVO so called 'patented' method, is... a German military tester that I estimate from 1938. For the moment let's trust Hickoks experience, giving us the correct 'English' dial setting for each tube. Somebody in Cleveland Ohio (where this tester was made..) must have had a huge cabinet full of good and bad tubes, and just tried out the right settings. The roll chart is the software of the tester, so to say. Now go to the restoration page of this tester. There were many things to do.... Please note the repairs are for both my 750's. So you may notice small differences in the pictures. 1) FUNKE W19 simulation. Here is something really new. With the 750 it is possible to do the Funke W19 tests with your Hickok 750. All you need is the famous Funke Blue book, which costs you about 30..50 Euro, and a copy of the card set which is on Ebay for 15 Euro. The Funke W19 is extremely popular in Europe, a top model, but it is completely ignored in the English speaking territories, except Asia who love the W19 also. Now don't ask me why that is, but this is where we are. The W19 is mainly an Emission tester, and the best and (only) one that deserves the name. Test results are undisputable. This tester proves what a good Emission Tester can look like. It is at the level of the better Hickoks, in terms or reliability, accuracy and correct test results. So if you have a Hickok 750 (or 539), read here is how to do Funke W19 tests on it! 2) Forward voltage of rectifier tubes. This is of particular use in the laboratory If you don't know much about tubes, and only want a quick result, you should use the classical test a by the roll chart. Example: The 80 rectifier to my experience should have a forward voltage of 25..40 Volts at 60mA to be good. Where 25V rarely happens, and above 45 the 'bad' range begins. Also note what it does at lower filament voltage. A good rectifier does not significantly change it's forward voltage if you do so. On the other hand, if the forward voltage is higher than normal, and you set the filament voltage one click higher, and the tube significantly improves by this, the tube is worn out. You can try to ge those results in-line with the classical test as on the roll chart. To do this test, just set up the tube from the roll chart first. Then set the 'Adjustable Voltage' to zero, and the test know to position 'H' for high. Flip the Vr-Mils switch to mils, and slowly increase the voltage until you see the milliamps go up. Check the forward voltage, this is when Vf begins. Then go on until you have 60mA and read the Vf now. Then do the other plate (switch setting is at the roll chart). You will see this is very easy to do, and you learn a lot about the tubes. 3) Forward voltage of Power Zener diodes. Same procedure as with tubes. Only you have to prepare an adapter this. Remove the base from an old octal tube, and connect two wires to plate and cathode. Take the connections for the VR105 tube. Make sure you don't reverse the Zener, and don't boost 100mA into a short circuited Zener, that is probably not so good for the tester. You will be surprised how bad solid state zeners actually are, they have high temperature drift, and bad load regulation compared to tubes like VR150 or VR105. 4) Continuity tester. This one is from the manual actually, but it's nice one. You can use the 750 as a continuity tester, when you set the 'shorts' switch for position 4. Then put two probes in the 'grid' and 'plate' connections. Because the tester has an isolated chassis, this is of no danger. Then the neon lamp will burn, below 200K resistance. Nice for checking switches, connectors, etc. It can test all tubes under real conditions. It comes in the same category as German Neuberger RPG375 tester, though the last is card tester, not switch operated. TV2 is unpopular though, but I never had one here, so I can not say what is the reason. What is unattractive (for me) about a TV2 is following: It is a tube analyzer, not a tube tester. Now when you have an analyzer, you often want to connect a multi meter to it somewhere, like measure the filament current with a digital meter, or one of the voltages. It often comes down to that when I use the RPG375. So a voltage test point AND a removable current bridge on all tube connections. Particularly THIS is why I use an analyzer like U61B or RPG375. Next thing is, you can set the plate voltage and grid voltage nicely by the data book, and then get a test result called 'Percent Quality'. Whatever that is supposed to be, that is not what to know. When I must set exactly plate voltage, and grid voltage, I am sorry, but then I want to see the plate voltage and Gm as a result, and additional some 'Quality' indication in percent. Still for that I rather have the red-green scale if the 750A or 600A. Then I know what I have. So personally, I think this is what makes TV2 a strange thing. It seems to me people don't know what it's worth, I have seen them go on Ebay in nice condition for 200$. Also see people ask 1800$ for it, which is definitely not what they are worth. When you are prepared to that much, you better buy a guaranteed to be mint condition Neuberger RPG375 or Metrix U61B, and enjoy that tester for the rest of your life. Working on Hickoks means they are easy to access inside, but the wire spaghetti makes you very tired. Actual failures are small, but hard to find. While working on a Neuberger RPG375 is a pleasure. All inside parts are nicely arranged in a row, on metal sub chassis, with clear cabling. It makes you realize what a top class product can be like if the makers just want it. You can repair a Neuberger RPG375 with an uncalibrated multi meter, and basic electronics knowledge. You can't say that from a Hickok. (However this does not apply for the older Neubergers, these are very hard to service as well. However the compare here is between the TV2 and the RPG375. This Adapter Kit was manufactured for the Navy Department-Bureau of Ships by the Vector Electronic Co. of Los Angeles, California. It consists of nine types of adapters, mounted within an aluminum transit case approximately 6" x 9" x 2 1/2" complete with handle. The adapters are secured within the case by means of mounting clips. An addition clip for securing the instruction book is provided in the case lid. Pin straighteners for the 7 and 9 pin miniature bases are permanently mounted in the center of the transit case. The tube socket adapter kit is intended for use in general electronics testing on equipment employing electron tubes. The nine adapters contained in the kit provide the facility for testing circuit conditions with practically all of the commonly used electron tubes. Who used old instruments, containing power electronics, will all know they need a repair sometimes. Something breaks here, something gets s defective there, and it just belongs to daily use of an old instruments. One L3-3 I have is NOS, means it was never used before. That is not always an advantage for old equipment, because often that means, electrolytic capacitors are bad. The other one was used very often, and it was officially calibrated every year until 1999, which was the last calibration sticker on it. The NOS one stabilized perfectly after 100 hours, and the used one worked perfect right out of the shipment box. All I had with mine, was a minor problem with a plastic cover from the inside detoriating. That I can replace easily by a wooden cover. My L3 never needed never any repairs at all. Only service, like a defective control lamp. All parts are still original, even the tubes. In the beginning I was a bit worried about the tubes, but these are good, and they stay good. These are tubes that are just in there, and I never think about them. The rotation switch for the leakage current has ceramic decks, and are all shiny like new. Handbook, detailed pictures, schematic, calibration, and a lot more... Click here to go to the L3-3 Page. EBAY BUYING ADVISE: Unfortunately the supply of new, NOS, perfect quality, L3-3 is low now, which attracts fraudulent sellers at Ebay. The problem is with Eastern Europe, Ukraine, Slovenian, etc sellers. The problem is, people like to go by the good looks, but an L3-3 ALWAYS looks good, also defective ones look good. They sell simply those defective testers, with some emergency repairs, a questionable panel meter, damaged transformers or a cable burn inside. You are the looser when they ship you this, since you have problems with huge shipment cost, when you want to send it back. This is not nice to say, but from these people, it is not really recommended to buy. So you are generally better of, buying the tester from near-by. Also, it is much recommended to request a known tube, pictured in the test mode, so you can see the thing works. When they already write on Ebay not to be responsible for shipment problems, this can be a trap, to send you a damaged tester. I feel sorry to say this, because there are sure many honest sellers too. However specially since you may not find a hidden defect so quickly, and since back shipment is very expensive, make sure you buy a perfect tester, and also clarify the details for back shipment cost, id needed. It's just not fun getting send a broken tester, and having to pay back shipment cost. It's very much advised to buy this from a 100% positive feedback seller only. Forget 99%. Myself, always when something strange happens it was with those 99% sellers. After all there are enough offered on Ebay. Just wait until a100% positive seller offers one. Such a person has a reputation to loose, so you are much safer. Read here also. Not recommended sellers: Be careful with a buyer from Budapest with tons of other equipment, he opens new accounts frequently on Ebay. Names seen before: hickoks, sunnygirl505. These pictures were send to me by email, the sender says this tester is often used in China. I have never seen this version. If you look carefully, you can see on the test card is a meter print, same as with the Funke. It has two mains transformers. From the different hardware and different switches on the deck, this seems a special model. but it can be easily recognized the factory is the same. It might have been a good idea to add this scale to the L3-3 cards. Somehow, this one does the same as the RPG375, but is deals with the negative points the RPG375 has. 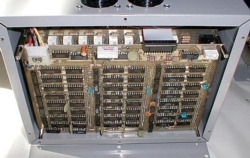 The Metrix U61B has no cards but many switches. So it is more universal, and I find it quicker to use. Also the internal voltages are electronically stabilized, so no readjusting of plate voltage when a tube draws more current. Also it has connections at the front plate for digital instruments. Vacuum quality can be measured with tube testers like this very good. 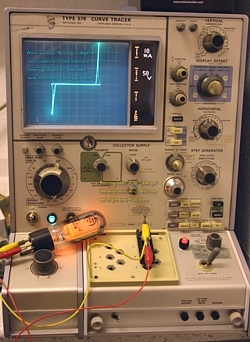 has a special connection to measure grid current directly, by connecting a nano-ampere meter to the tester. A great feature is the tube protector circuit. When the plate current meter is more than 25% above the maximum of the meter, the plate current will shut down, and you need to reset it. This is done with a very special, programmable current sensitive relay. So at each meter setting, it has another sensitivity. Another protection is when a tube has a short circuit, this will disconnect the whole tester from the mains, and a red indicator pin comes out of the front panel, that you need to press back in, to switch on the tester again. This is a master piece. I use it for the very expensive and delicate tubes, like ECC803S etc., because of the plate current protection circuit. Also well suited for testing large numbers of tubes, Because of the protection circuits. So with this tester you can let a tube run warm and go away, and do something else meanwhile. When the tube starts to draw too much current, while you don't see it, the tester will shut down with a loud "clack". It happens often with KT88. So you'll hear that and can check it. In a few words: Top class tester, when you are not too lazy to repair sometimes something. I had a few small repairs with mine, just some small capacitors were bad. Very convenient, and very versatile to use. Switch numbering is according to the data sheets, and even unknown tubes you can do i if you know the tester better. Lovely build tester, with high quality switches and precise meters. The Neuberger RPG 237 was a standard for it's time. It is an AC Tester, sweeping a tube through the WHOLE RANGE tube curves while testing it. and it produced 20mA as an average value. Suppose you measure a tube that must give 20mA at normal settings. The RPG237 then gives a very good impression of the lifetime left in the tube, because if the tube can do the 20mA, but can NOT do the peak current any more, you will get a lower reading than 20mA, which is right! This instrument is a genius. leakage, short circuits at all electrodes, measure resistors and capacitors. Apart from tubes, it has some multi meter functions, also for testing capacitors. I tried a few Mundorf precision capacitors, and all I can say, it indicated the values exactly as printed on the capacitors. Wow! it should be able to measure grid capacitance as well. Just a matter of connecting everything the right way. it produces accurate results with tubes like ECC81 or similar. I had to connect those externally, because it has no sockets for those. When comparing the results on the L3-3, I can say this RPG237 still works fine. this old and unrestored RPG237 gave also that value within 15%. and understand why it works so reliable after almost 70(!) years unserviced condition. In a few words: Still perfect fine after 70 years..... AMAZING. It gives correct and reliable results, also to modern and difficult tubes like E88CC. The disadvantage it has no modern sockets, but you can solve that easily by connecting a Hickok adapter kit MX949 to it, and you're done. Their final model, and largest tube tester they ever made. The Neuberger company still exists. This is a parametric tester. Can measure vacuum, and show all parameters at the same time. Dynamic tests are made as difference of two measurements. I have this Neuberger 375 from the widow of the first owner, and it was said he never used it. The tester appeared fully unused indeed. The meters are very good. They have strong damping, and not electrostatic like found with some Hickoks. can be measured at the same time. Some meters have more functions. Connections are on the front for external instruments, but the build-in instruments appear to be incredible precise, so you don't need any external instruments. This is no quick tester for radio shops or TV Repair men. This is a full featured laboratory instrument. It is card-based, but no need for using cards. When you want you can do all settings by hand, and there are standard banana connectors to all tube pins, and also current links to each tube pin. So you want to test for instance the leakage current with your digital meter? No problem, take out the link, and put the meter in. If you know how to do it, you can also tap the plate voltages and other voltages, use it as a multiple power supply for lab experiments, with all voltages and currents adjustable, and with meters. So you have a 500V 100mA power supply too, and connections are simply on the main plug-in board, top left. (see the picture I used). 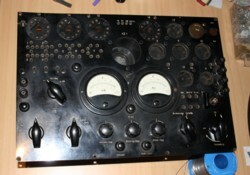 The plate voltage is tube rectified with Telefunken tubes. These give natural protection against short circuit. So a short circuit will not blow the fuse or the tube under test, but uses the rectifier tubes as the current limiter. Also the 6C33 can be tested when you use an extra socket, same method as with the 211 tube. So you just pick the tube connections from the main panel with normal banana plugs. So there is a (banana plug) connector for 'plate', two for 'filament' etc etc. As far as I know, there is no other tube tester that can supply the filament current for the 6C33. It features the very nice Neuberger Rotational switch, before you test a tube, you can do leakage or shorts. This switch works the same as the Funke W19 or W20. Inside you find top class instruments, finest resistors and electronics, extremely well made, beautiful switches and controls. It is the absolute winner in terms of perfect construction, no other product comes near. Note the deck has no German on English words, only symbols. So any country, you can use it. In a few words: A top laboratory product, when you have the muscles to carry it. Disadvantage is the unstabilized voltages, and older type sockets are not available on this tester. However it is one of the few (or only?) vintage testers that can do adjustable 500V @ 100mA. It can test all tubes from tiny fragile to big and heavy. The card system makes it fully universal, and SAFE. So you when have a test card, you can not do much wrong. If you want to test a 50Watt tube at 50 Watt, this is your tester. Besides it is a perfect work bench adjustable power supply, with convenient banana sockets for all voltages, and each with it's own meter. Just make the right card for this yourself! Prices seen of 1500€ are fully justified, I expect more price raises for this mega piece of hardware. 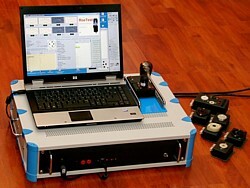 Tektronics 576 Curve Tracer System. 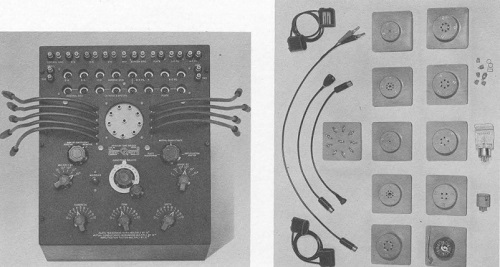 The 570 was the first curve tracer by Tektronix, followed by the later 576. Though the 576 is not really made to test tubes, you test tubes with it, when you build a test fixture for it, and you need an external power supply for the heater. 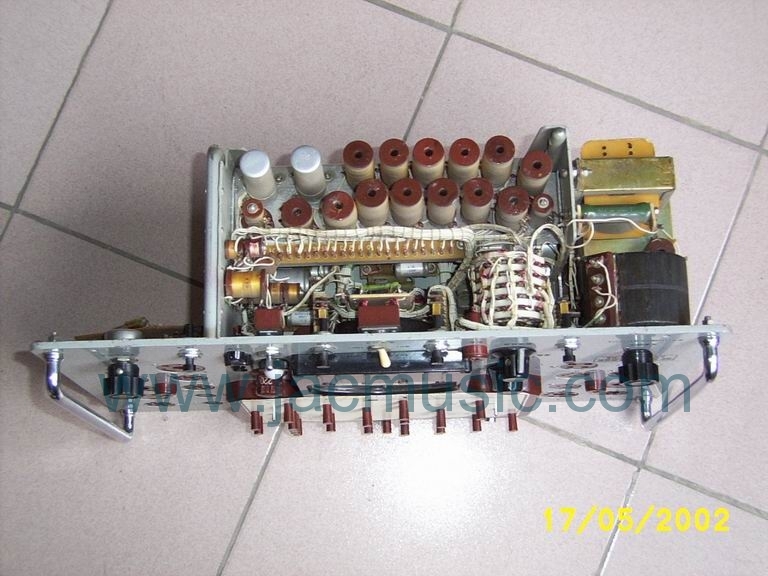 There is MX949 Unit, originally build as accessory for the Hickok I-177 tube tester. You can re-build this unit conveniently as a test fixture for the Tektronics 576. Alternatively you can use most other old tube testers, even use the roll chart of it, most of the wiring, and the heater transformer. Here is the schematic of the TV11. This is a nice Emission Tester. It looks like an antique piece, but it is better than may other 'later' types. Tube testes of this kind have some advantages and some disadvantages. Many Emission Testers were made and are still around. When you buy one of those, you can have one which is nice and pleasant to use, or have one that is inconvenient, and only 'so so' with the results you get from it. You need a mains adapter knob, so you can calibrate it for the right mains voltage before making a measurement. You will see that with an emission tester, already smallest changes on the mains voltage give a big reading difference. Take a Variac and try it! So if this knob is missing, you have a tester that the makers did not care so much about precision. Make sure the switch panel in the middle has the easy flip switches as with this one. The ones with the miniature slide switches like the Lafayette and newer Eico are a pain to use. You have to set the switches before each measurement, and for the leakage and shorts test you need to test each tube pin one by one, by sliding up and down each miniature switch, which is really nasty to do. So if you can quickly flip them as with this one here, it's what you need. A tester with a build in roll chart is better than one with a manual. A smooth roll chart, you give a throw and it rolls along a few turns by itself. They fool you on Ebay with that. When you need to push the roll chart, and it moves only one inch at a time... beware it is a very long roll of paper! This is hard to fix, and in the end the paper will tear and break. You may need a new NOS paper roll, and that's really hard to get. The leakage test must correctly indicate leakage with the intensity of the lamp. That is done by defining a certain leakage where the lams begins to burn. So the beginning of the glow (faint light) must be at 300...400k Ohms leakage, nothing else. When the lamp only indicates shorts, that's useless. Old tubes have no shorts, but they do have leakage. To test that, just stick in a 400k resistor at two random pins, and then try to find that leakage. The transformer must not be underrated. If the tester you want to buy is very tiny and thin, the transformer is probably underrated. Why does matter? It means you can not continuously test the tubes, and such a tester will have a 'test' button. This TV10 has no such 'Test' button. It has a test switch. So the TV10 can test a tube continuously, and heat it up while doing so, for instance for 10 minutes if you want it. Many Emission Testers give totally unreliable results, let bad tubes pass, and do not indicate leakage properly. Verify that with tubes that you know to have some specific defects. Make sure it has enough old type sockets. TV10 has the same schematic, only TV11 has a solid state diode and an output for noise tests. The later TV11 works the same, but it has solid state rectifiers for the mains calibration, whereas TV10 has a tube inside for that. Some later TV10 have Selenium cells build into the meter, making it a pre-version of the TV11. It is recommended to check all resistors, and replace them with new ones when deviation is more than 5%. 8) Tube testers collection - DIGITAL PART. I own a few digital testers myself, and it is a category for themself. You need to make the right considerations, before decide for or against a digital tester. Let me list up some of the advantages and disadvantages here. 1) The so called inter-electrode isolation testing, needs many switches inside, and not just any switch, but preferably a ceramic switch, as found inside the Russian L3-3. With digital testers, this is always a weakness. Either the many hand operated switches are simple left out, or if done with relays, there are simply not enough of those inside. Actually I know of no digital tester that can do inter electrode testing between all pins of any tube. Some can do cathode to heater leakage, and that's it. Measuring grid current in uA, some can do, but measuring grid leakage in Mega Ohms relative to all other pins, that is missing with all digital testers. The beautiful way this is done with the AVO Testers, differentiating even between hot an cold condition is an example of mature product design. Alone the analog circuit that is behind this would be extremely hard to reproduce digital, as it works with a high AC Voltage + very high resistor in series. This is is the ultimate way that can even detect corona leakage. Note, the inter-electrode isolation testing gets more important for the future. We will be dealing more often with older historical tubes. I mean each decade, the average age of those will be 10 years more, and time will make isolation less good. Also, we will be dealing more with new made tubes. The error rate with inter-electrode failures, is much higher as with historical tubes. Chinese tubes have a bad reputation for this. Inter-electrode resistance is very high in general, but many failures. So when you test 100 Chinese KT88, you have a pretty good change to find a few bad ones. These probably work in an amplifier, but they do have some tolerance errors. Whereas with Russian tubes the error rate is lower, but generally the leakage by itself is higher, and the trend for newer production is not good. So either way, this function gets more important. With the AVO testers, due to the highly intelligent test circuit, even electron emission of the heater itself without plate voltage can be measured this way. Though this is not described in the AVO manual as a measurement, it is said at least at which settings this is indicated. Real specialists will study this option, and learn to estimate it. It is an illusion to find this ever in a digital tester. 2) Tube sockets. Have a look at the test deck of a AVO Mk1/ Mk2...4, and you have a feeling of what possible sockets one may need. The test book of AVO is filled with hundreds of pages test settings in small printing. The value of this database is enormously. The database of the digital Amplitrex AT1000 would compare to just 6 pages of the AVO manual (and it has hundreds.). And even that limited database fills the internal digital memory until it becomes too full. Besides it has no full possibility to connect to any tube pin. So even though the tester has an octal socket, it can not test all of the tubes. Not so with AVO or Funke. Just take any tube -whatever- and you have the socket, you can connect it any way you need, and you have the settings in the book. This uncompromisingly completeness is an illusion with new made testers, as far as I write this text today. 3) Overload / Shorts protection. A digital tester can be easily destroyed when you ignore the manual, or when you insert shorted tubes. 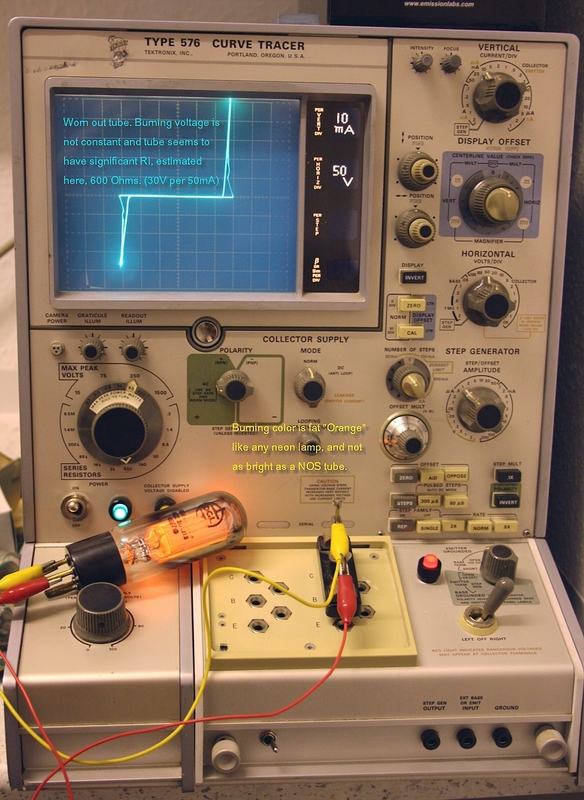 With a good analog tester that becomes very hard to do, but of course it is possible as well. A problem with most digital testers is the failing shorts test for ALL terminals. So there is a software controlled current limiter on the anode circuit, but this does not help much when the tube anode is shorted to the control grid, as software is too slow for that. So when that happens, and the anode is at 700 Volts, this will blow up the control grid circuit. And once that is damaged, this may blow up the anode voltage circuit as well. Here is what can happen: I once had a 6922 tube from Electro Harmonix, and it had all electrodes shorted to each other. There was a fine metal wire wrapped from each pin to the other. Also they once send me a 6SN7 with the socket rotated one position. Don't ask me how such things can happen in production, because such a tube should fail all tests. But I do know they send such tubes out to me. This gives the craziest shorts. The 6922 tube burned only one resistor of my L3-3 analog tester, but I am pretty sure such a tube destroys the AT1000 or SOFIA digital tester instantaneously. The 6SN7 with the rotated socket gave no response of any kind in the L3-3, so it survived that attack without any damage. 4) Hardware and Software aging. A particular digital tester is always nice for the moment, but sooner as you expect, the technology gets old, and repairs may become nasty or impossible. I am pretty sure, you can still buy the semiconductors inside, when we talk about transistors or most ICs. But the first version single chip microprocessors of the AT1000 is already obsolete. So you better not to get a problem with that part. If the tester needs installation of a program, on your PC, Microsoft always tries to make your old software obsolete. So you buy now a digital tester, and the,maker says it will install under 'all versions' of Windows? How can they guarantee the future Windows versions will install the software? Reality is, in 10 years you can only run it on antique Windows computer, because 'Windows25' or whatever the version 10 years later, will refuse older programs to install. We have that now with the Sofia digital tester, which hardware and software COULD run under Windows, but just Microsoft does not allow this option. This can not be said often enough. Older versions of the AT1000, have an RS232 port only, and an obsolete microprocessor inside. Do not think any RS232 Card will install on any PC. It doesn't. RS232 is 'old' and there is little support. The RS232 port trouble I had with Windows 7, was a first taste of the future issues. Note, the AT1000 software is written in virtual basic, which is always some version', and I can assure you, the version is as old as can be. So if some day, the Microsoft Gods decide you need version 'xy' to be allowed to install it on Windows 25, the game could be over for your AT1000. Since I have seen this happening so far always, and with everything, for me this is something that is going to happen. The strongest weapon of course is good software support. Well, for that you can read that part of my experience here. 5) Voltage, Current. Make sure, the digital tester can do the same as a good analog tester. Can it heat 20Volt tubes? Can it do -150V on the grid? Can it supply 500V plate? How about the screen? Can it do 250mA plate current? Can it heat power tubes with 50 Watt? Can it measure 0.5uA leakage? Can it measure 10 Mega Ohms leakage resistance (Are you sure??). Is the leakage tested under high voltage? In both directions, as will naturally occur when you test with AC? Can it test any heavy rectifier under real load conditions? Can it also test the 1mA rectifier of your radio detector circuit? Can it test Voltage regulator tubes? Can it pentodes triode-connected? Can it test the oscillator-mixer tube of your radio? Can it test magic eyes? I hope I forgot nothing here. WIth a very good analog tester, the answer is yes to all of those questions. 6) Good-bad indication. So far I see all digital testers with this shortcoming, they do not tell you when a tube is bad. That is because the writers of the software, either do not know how to test for that, or do not have the time and resources to test thousands of known to be good and know to be bad tubes. You do get a precise number of transconductance. Then you say, fine, but is the tube good or bad? You still don't know. This is where the good old Funke W19 is my top favorite, but sure also the Hickoks. Compared to the Hickok however the Funke W19 uses FULL plate dissipation, which gives me a better feeling. So all digital testers seem to be missing this #1 feature of a tube tester. They do not tell you if the tube is good or bad. 7) Precision. Of course digital testers are the winner here. Keep in mind though want is a need and what is a want. So you want 0.5% precision, but do you need it? You can only answer that for yourself. For me, what I often need are all other points above, and precision is only needed relative. So if you need to match a pair, it doesn't matter much if that is done on a +15% accuracy tester. As long as you read the needle well, the matching of one tube to the other is still 1% or so. Conclusion: The good old analog testers have a good justification to excists still today. Of course digital testes are something very nice. Having the AMPLITREX AT1000 is having the best we can get, and technologic advantage is what makes our company attractive for customers. So we always use best instruments we can buy. If not, we 100% restore an old one. (see Restoration report about Funke W19 we use, and two 'Kali br L3-3' under tube testers) : This testers is, right as I say, 'the best we can buy', though I think it is not a very good tester by itself. It does what I want now, after I have learned to work around it's many issues and compromises. It can not beat my 1995 Sofia tester in any way. RISKS. As far as I recall, the Amplitrex AT1000 has been introduced in 2004. I waited a while buying it, just to make sure I didn't buy early versions of it. Though buying the later versions, I found several issues myself. VALUE. The item is expensive, and to have it keep the value, the manufacturer should produce software updates on a regular base. My disappointment here is very large. It has several issues, that would be easy to fix in software, but I can't do this myself of course. I am very unhappy about this. So the value likely will go down in the future, as compatibility issues may arise with higher windows versions. The tester is WINDOWS ONLY, and you don't have the code, and you don't know what this is doing. So if the Microsoft Gods -say in the year 2020 will decide, you need this or that upgraded software version with 'Windows11', and you don't have it, you can't install the program on a new PC. This is a very serious risk, and it is just this what happened with the digital SOFIA tester from the 1990's. This is in sharp contrast with some of the very good vintage testers which are more like an investment, than something you need to write off some day in the future. So keep this in mind extremely well. Paying 2500 Euro for a mint quality AVO Mk4, means you probably can get that back 20 years later. The same amount invested in an AT1000, you need to write that off one day. SOCKETS. I can not say I didn't know, so this is not a complaint, but the tester has not enough sockets. I have a small collection of adapter sockets made myself. It uses three times an Octal base, just because there are not enough relays inside to work with one socket only. The tester WILL NOT switch the heater wires, so the heater is soldered at the socket at a fixed position. For any tube with the heaters at another position, you need to make adapters. So I had to make an adapter to test the 5Z3 rectifier, which is nothing but an 5U4G with a UX4 base. However the UX4 base of the tester is soldered to the DC supply, whereas the rectifier circuit of this tester is AC heated. So there you go again, ANOTHER socket adapter I had to build. Amazing but true... I have found a software way to test 4 pin rectifiers on the UX4 base of the tester, so now I don't need that stupid adapter any more. Please understand I will not hand this out. I think it's the manufacturer's work to provide this to you. I realize they may not know how to do this, but really this is their responsibility to provide solutions, not mine. Materials. The 'feeling' of the tester is much better than it looks on the picture. The case is very good quality and the deck plate is thick and heavy material, and the (few) sockets are good quality. When I see how some of the Hickoks look after so called 'experts' have worked with them, this very rugged case for the Amplitrex is a very good idea! Tube sockets. It must be said, the 9pin socket is a too tight and it damaged tube pins of some expensive ECC88. So you plug in a tube a NOS tube a few times, and the pins look used already. For the rest, tube sockets are fine, and even the (dangerous) metal rivets of the Chinese UX4 sockets have been carefully insulated. Good job. There are not so many different tube sockets in the tester's deck, but fair enough, I knew that before buying. Noise. Sorry, the cooler fan is definitely too loud. WARNING. 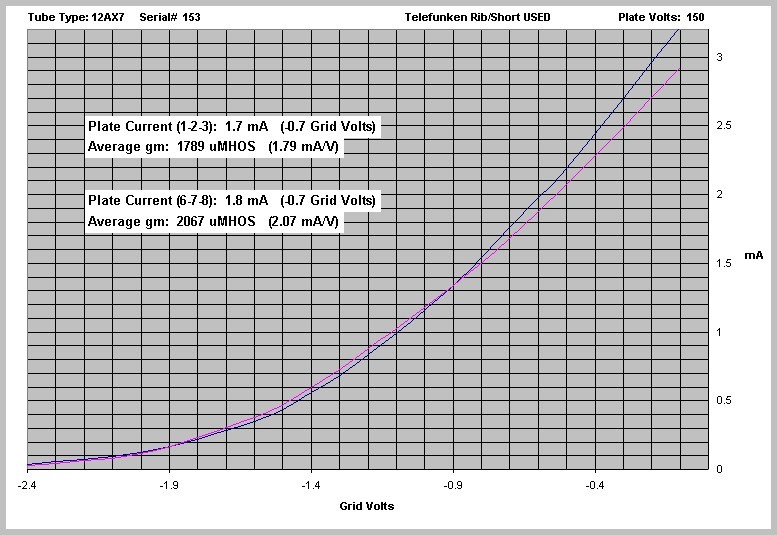 The Grid voltage is measured wrong for Directly Heated Tubes.Half of the filament voltage is added to the grid, and it was not compensated in the software. (Though this would have been very easy to do). So when the tester draws a '-1Volt' line for a 300B, it is in reality the -3,5 Volt line. Same error is made with the normal 'Tube Test' page it produces. With tubes of high grid voltage this is no problem, but for tubes with low grid voltage this is a serious problem, since it may have the tubes look 'bad' while in fact they are excellent. For instance RE134 has 4Volts filament, and it's a high gain tube. So 2 Volts error on the grid, turns a good tube into a bad one. Calibration: hey do have calibration points inside, but there are several ways to check the voltages from the outside, so you can regularly verify that. Also since we use three amplitrex we can compare one with the other. Mind you, the grid voltage has an internal series resistor inside, so you can only verify the grid voltage with a tube volt meter, or any other very high impedance electronic meter. Or, tap it from the inside, before the series resistor. Conclusion for Stand alone mode: When you are not so technical, and just need some quick good/bad results, the stand alone mode is what you need, and don't even think about computer control. However this tester does not tell you when a tube is good or bad. This can be real problem for non-experts, and you MAY want to prefer a good old Hickok with a red-green scale. So with a Hickok the red-green scale is really reliable, I can tell you so. The Amplitrex says something about Emission in percent, and Gm in percent, however it is not testing Emission at all, but plate current and just calls that emission. Which is a mistake in the software. Furthermore 20% below average Gm is not so bad as long as the tube heats up fast, and plate current is strong. Vice versa for low plate current. It is no problem when Gm is above average and heat up is fast. Some factory-new tubes can be that way. With some understanding of tubes, the stand alone mode is a very good one. Automatic leakage test and grid current tests are reliable, and switch off the tester in case you're trying to test a tube that is a problem perhaps for the tester itself. In the end you have similar results as with the L3-3, but without all the buttons and knobs and cards and knowledge you need for the L3-3. Here is the advantage of the Amplitrex. It fills a huge gap on the tube tester market. Conclusion for Computer control mode: This is actually why I bought it. However this function is more difficult to use, and not very self explaining. A problem for non-USA users is, that you MUST set your PC to USA Region, or the software will make errors and/or crash. So used a dedicated PC for this and set it to USA Region. It is difficult to use database programs like Open Office (or worse: Excel), since problems arise where comma's and are used in Europe, where the USA uses semicolons and vice versa. If you ignore this, you mess up the tube data tables, and the software will stall, or produce weird mistakes while drawing tube curves. So to prevent this, I use now a dedicated PC, which I set to 'USA' region. We have now two AT1000 in use, here at Jacmusic. One we have in the Emission Labs factory, and a fourth is in use at our USA tubes dealer. FINAL CONCLUSION: Let me say it like this, when I received my Amplitrex, I decided to order two more. I think that tells it all. Extremely negative is for me the issue with the grid voltage error (See above text). This item was brought up to Amplitrex, and really a quick software repair should be a piece of cake. I heard from another user, there is only a patch with the data tables, which is not regarded a decent software repair my myself. It is regarded such by Amplitrex, so we have another opinion about this. Even though this partial solutions excists, I was never informed about it by Amplitrex in the form of an update, or user's letter. Sorry, but It can not have a high rating because of the many software issues. Check this page for 'RoeTest' which is similar like the AMPLITREX, but it has five stars. . Above pictures show some versions. As you can see the case is always individually made. 'ROETEST' KIT BY HELMUT WAIGEL, GERMANY. Originally listed as a DIY Product, I have removed it from this category, and put in under professional products, right here. This a KIT version. What is provided by the maker, is all hard to get hardware, such as the mains transformer, pre-programmed microchip, the front plate, empty printed circuit boards, etc. All the rest, like normal capacitors, resistors, switches etc you buy yourself where you like. 'RoeTest' is German for 'tube-test'. This very nice product, is privately made by Helmut Weigl in Germany. This is digital tube tester, the most interesting one I know. This is a kit, so you have to build it all by yourself. What you see here, is a possible way it can look, as made by the DIY builders. So the housing is your own project. What you can buy is a CD with the circuits, the description, the software, plots of the printed circuit boards, a drawing of the front plate + company address who makes the front plate for you (or design your own). Printed circuit boards can also be provided to you, as well as some of the hard-to-get hardware parts such as the transformer. This list ends with the on-board software that you get burned into a micro processor which is part of the ROETEST DIY project. All of that for a price that I think is extremely reasonable. The pleasant thing is, this tester is kind of non-compromise. It is based on a motherboard, and then simply one board for each function. So you have a grid voltage board, a plate voltage board. etc. Any problem with a board is automatically reduced to that one board only. Kind of easy to repair and easy to service. Not fo forget a FULL switchable relay matrix board. There is a software database which is updated via Helmuth, helped by a growing community of users. That database alone is fabulous. This product is really 'it' when you are a DIY. 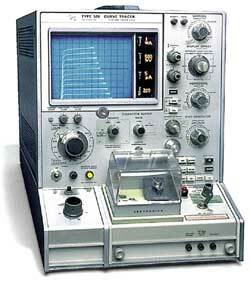 This was the first commercially available PC aided tube tester, and it was and still is a very good machine. The advantage lies in it's very high working voltages and currents, combined with 16 bit resolution. 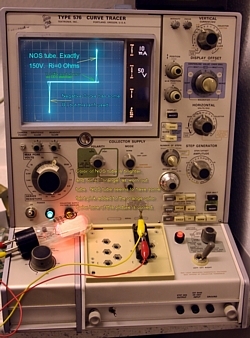 There is no other tester that can do 700V at 250mA not even old analog tester, I do not know of one. The disadvantage is, there is no support of any kind. Only thing is, you can send it in for repair, and they can try to fix it as long as they have parts for it. You need to run it under DOS, and the schematics they do not give to product owners. This is accepted for running production, but for a discontinued product, I miss the point of this. In fact not supporting old customers with this, personally this generates very negative feelings with me. Of course this is only my personal view. So before I buy a new product from this company, I think also of the day where it will be discontinued, and I get stuck without schematics. This tester was made for DOS only. It will not work good under windows, since it needs real time access to the RS232 and LPT1 port, and not the manipulated ports as in Windows versions. A DOS emulator solution exist, but it works not fully reliable. What is it worth? Hard to say. Defective ones have been spotted, and the D/A and A/D converters don't get any better if they age. So the one you buy many be fine, or just as well not. Take care before you buy one. Repairing a Sofia will be not easy. +++ Top class software. Curves are professional looking. Not those 'Microsoft' curves of the Amplitrex. ++ Excellent tube curves by default. Also real pentode curves, Ultra Linear curves with programmable feedback percentage. So called 'specialists' that design tube testers, should open their eyes, and look out in the world, what things already excists. Sorry for saying this, but it has to be said. + Perfect graphics. It is amazing what DOS can do. To me it looks and works the same as windows. + Speed! It is amazingly faster than the Amplitrex. It seems to use a second microprocessor for the A/D conversion. + Genius matching software. Made by intelligent people, who did their homework. + It can simply do more things than the Amplitrex. - They are off calibration after a long time, but error is minimal. - Tube connections must be done with plugs. - Factory support is strange. Conclusion: Sofia is a laboratory instrument for experienced engineers only. You need to install it under DOS, but this gets rewarded by superior speed, and beautiful software functionality. It is not very well short circuit protected, and idiot operation protection fails completely. Hardware issues I have seen almost none, only insufficient cooling of the fly back diode in the heater power supply regulator, and unprofessional mounting of the AC to DC rectifier (the one that feeds the whole tester). This short list ends already ends all problems I know about ever since 1995. So, a totally perfect result. The tester damages easily by mistakes. Consider, if the the tester is damaged, chances on repair are good. I can try for you. Extremely negative is for me the issue with the grid voltage error. It can not have five stars because of this. Same reason applies for the Amplitrex too. A silly mistake. Well it happens. This amazing little tester offers the best value for the money. It is sold as a kit, including almost all electronic parts, the PCB and the software. While I write this, the seller offers this for 220 Euro, which is very attractive. The u-trace does a complete, normal test on the tube. So no tricks with AC signal of whatever. All voltages are stabilized. Testing is in 'pulse mode', so each test point it touched only short. Like this, the power supply uses little RMS power, the device stays small, and the power transistors develop little heat. This is really a good idea, and a nice concept. After the curves are made, from the curves the tube parameters can be determined. Well, as seen before in the SOFIA, so what was good there, is good here also. I like this tester. The disadvantage may be the 'kit' version of course, and no housing. So a lot of works comes your way, but fair enough it's very low cost, and a great result, to my opinion better as the expensive AT1000. The Dutch engineer sure knows his job! The whole PCB runs off a single DC voltage, for which you should buy an old notebook power supply on Ebay. There is no better and cheaper way to get the DC power you need. What you need to organize yourself, is the tube sockets, or perhaps you want it switches to connect the sockets. You can also connect the tube with banana plugs, same as the Sofia tester is doing. (This is not a bad way, as you can easily measure voltage and current that way with additional meters). I want to write more about it, when time allows, and also compare it with some other digital testers I know. After all the experiments with other companies' tube testers, and always having the same struggle against measurement errors, and limitations in plate voltage, plate current and filament current, and whatever more...... I came up with this idea. The beginning is a precision regulated 550 Volts, 180 Watt power supply from Fluke. 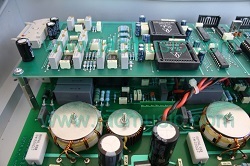 Then the filament voltage, and grid voltages comes from Agilent precision power supplies. Add the necessary instruments to measure all you need to know, and there you are: A precision tube tester. So now I can measure the grid current any way I want, and everything else a normal engineer wants to know, apart from reading 'Good tube' of 'Bad tube' on a meter. Transconductance can be measured most accurate, because all I need to do is move up and down the grid voltage 500mV. The difference in plate current can be used to calculate the transconductance. Also plate impedance and gain can be determined this way quickly. Actually this is the tube tester I use for all tubes that need a lot of plate dissipation. Needless to say this the ideal tool to regenerate and burn in tubes also. The test fixture can do Octal, AD1, UX4 and UX5 tubes. The other tubes go on the Russian L3-3 tester, and for a quick 'good/bad' test result I use the Funke W19. The Agilent power supplies have a memory so I can store five complete settings. Happiness comes up when using this. The stars are not necessarily many for a very complicated tester. They are also for a non-fooling products. So a tester with no mistakes, no silly things, etc will get more stars. Also five stars can be given for a relatively simple but fair tester, which is holding it's (simple but fair) promise. Whereas an expensive, new tester with a lot of mistakes, can never get even four stars, by the definition of 'four stars'. Some, or unreliable information, but better than nothing. Good tester, but may have shortcomings or bugs. Good tester, perhaps some minor points that may be improved in the newer model, but generally a very satisfying product. Very good tester, an honest product, without any shortcomings or problems of any kind. Or even better as expected. Precise Tube tester, Model 111. Why pay 70$ for an EICO KIT when you can have this better one for 69,95$ completely build. Here you can see what a brand name is worth. Wow! You made it up to here. You must be a serious tube aficionado.